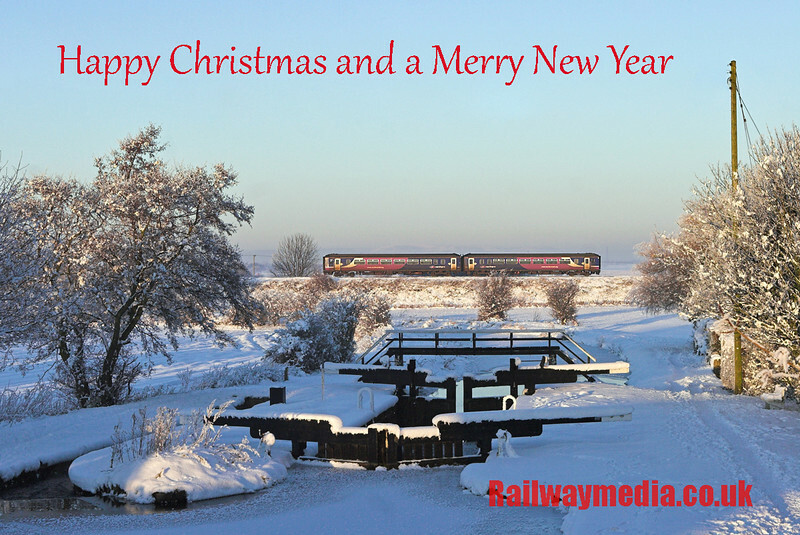 Welcome as always to the Railwaymedia blog, a short one and obviously the last of 2014. Following the last edition at the very start of the month I have been out a few times though not specifically for anything rail related. With a week off work I decided on a North Country 4 in 8 Rover which covers the area north of a line from Preston to Leeds and Hull up to Newcastle and Carlisle. As the name suggests it is valid for four days out of a maximum of eight; I knew from the start I would probably only get to use it for three days but it was still worth doing to try to visit most of the Wetherspoon pubs in the North-East, an area I've not covered too much in the past. I had two days planned out initially, one to cover the Durham Coast south of Sunderland and the other to do a branch of Wetherspoons in Richmond then to do the line to Whitby which I have never travelled over. 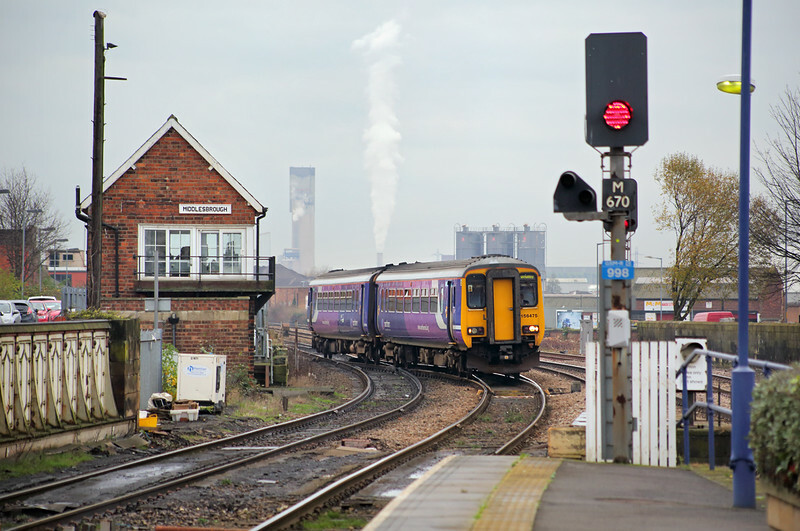 Which I did on what day all depended on a right time arrival in Newcastle from Carlisle as the Whitby schedule had only a five minute connection in order to get to Darlington. As I made easily the 1000 High Speed Train from Newcastle on day one that was what I did. There were a few delays heading south but the bus I had planned on catching was late too! 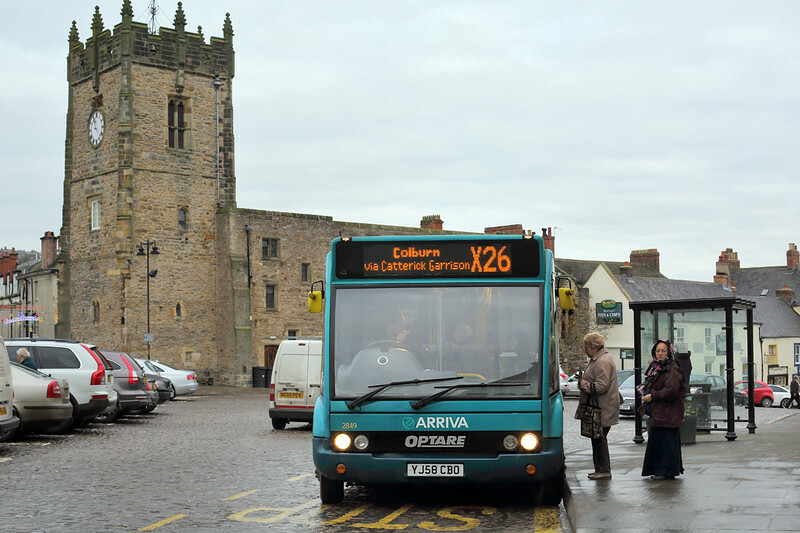 Richmond is about 14 miles from Darlington and has a good bus service during the day with the journey only taking 30 minutes and operating three times an hour. Time keeping on the route left a bit to be desired but as is common now since I resumed taking pictures of buses, I leave myself extra time in order to try to get some photographs whilst I am visiting places. Richmond itself is a nice town with a large Market Square (used normally as a car park). It was a pleasant place to visit on a dull wet December day though I can imagine it gets a bit busy with tourists in the summer. I had about 45 minutes in total in Richmond which was enough time for a beer, a few bus pictures and to buy a couple of pies from a local bakery, before I returned to Darlington in order to get the train to Middlesbrough. I arrived at the station to find a Rail Head Treatment Train sat waiting in one of the bay platforms. The class 142 behind it was meant to be working the train I wanted but as it was blocked in by the class 37s the spare unit in the other platform had to be used instead. There are three Wetherspoons in Middlesbrough. I had another 45 minutes between trains so only had time to visit the one nearest the station and to stock up with some beer for the 90 minute journey to Whitby. 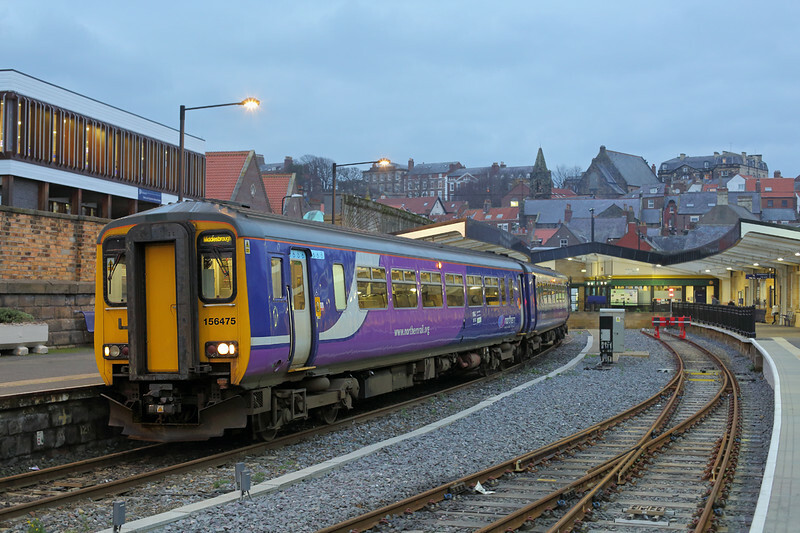 There is currently only four trains a day between Middlesbrough and Whitby although there is talk of more services being added. The 1404 from Middlesbrough was the last one I could catch: I could have returned on it to Middlesbrough but I would have only had 20 minutes in the town. Fortunately there is a good bus service linking Whitby hourly with Scarborough, it taking just over 60 minutes and, fortunately like the Darlington to Richmond service, provided by Arriva so I could utilise the same £7.50 day ticket. This is very reasonably priced as it covers all Arriva services from Scarborough in the south to Berwick in the north (and even west as far as Carlisle). As can be seen it was dusk by the time I arrived in Whitby so the bus journey to Scarborough was in total darkness. I am sure Robin Hoods Bay is lovely to see in daylight but all I could tell, even sat at the front upstairs on the bus, was that there are few street lights there and that there is a very big hill to climb out of the village. 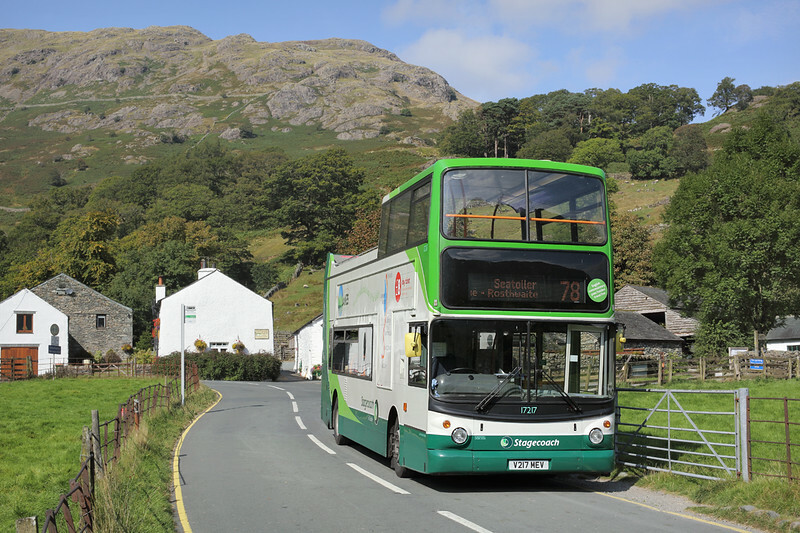 The bus was obviously still geared for service in London where it started its life based at Edmonton rather than 1 in 5 climbs along the North Yorkshire coast! After a rare weekend away with the wife in Edinburgh, the following week I managed a further two trips to the North East. All three trips were made by going out via Carlisle and returning via Leeds and with the Whitby trip boxed off the next on the agenda was to do the Wetherspoons south of Sunderland. Again this was mainly a drinking day with a few bus pictures and the odd railway shot too. 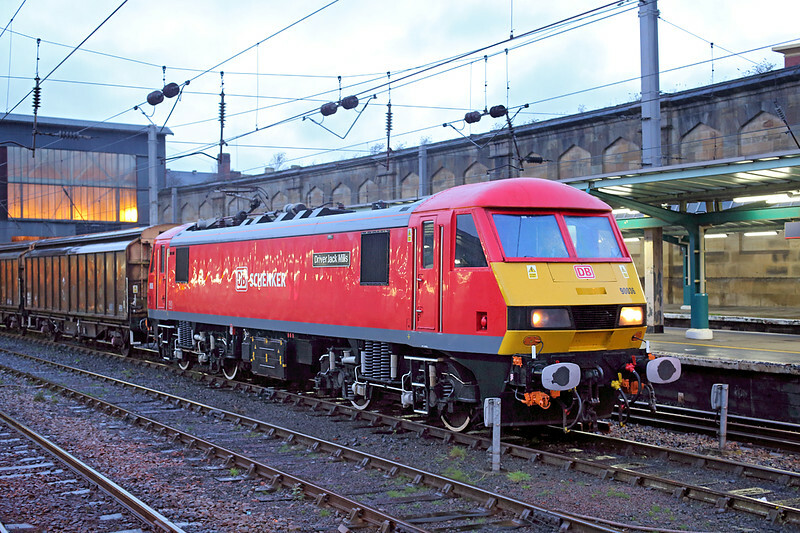 Having missed a picture of it on the previous trip my first aim of the day was to photograph the DB Schenker additional postal service that is running daily up until Christmas. At this time of year it is only just getting light in Carlisle at 0800 but the newly repainted and named 90036 brightened things up a bit. Named after Jack Mills the driver of the train involved in the Great Train Robbery it is very appropriate that it should have been being used on a postal service. First call of the day was Seaham. The old railway line to the docks is now a walking route from the station to the town centre. The harbour is still used for commerce although obviously no longer rail connected. A few rails and a memorial to the mining industry are nice touches. Peterlee is not rail served either so it was a bus that I had to catch there. As I was going to use several bus operators I had to get a £9.50 North East Explorer Ticket. This shows what can be done to benefit passengers, very few areas ouside the former Metropolitan PTE areas have multi-operator tickets so unless you have a pensioners free pass you end up having to buy several expensive tickets to make a few journeys if they aren't all run by one company. Valid on everything except trains in roughly the same area as the Arriva day ticket I mentioned earlier this is also very good value. After Peterlee it was on to Hartlepool. I had allowed myself an hour to visit the two Wetherspoons there and to get some bus pictures. My last visit to the town was in 1991 when the then local council company were still running a large fleet of elderly Bristol RE buses. 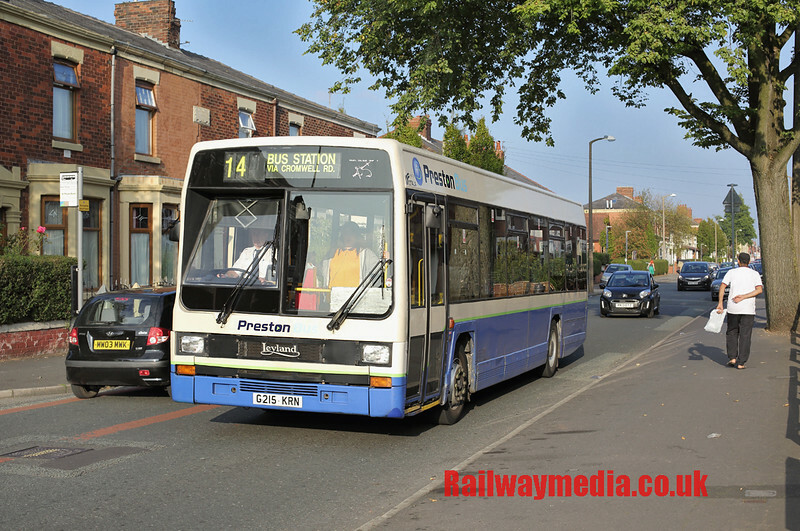 I have a few pictures that I took that day of Hartlepool Transport which not long after got purchased by Stagecoach. 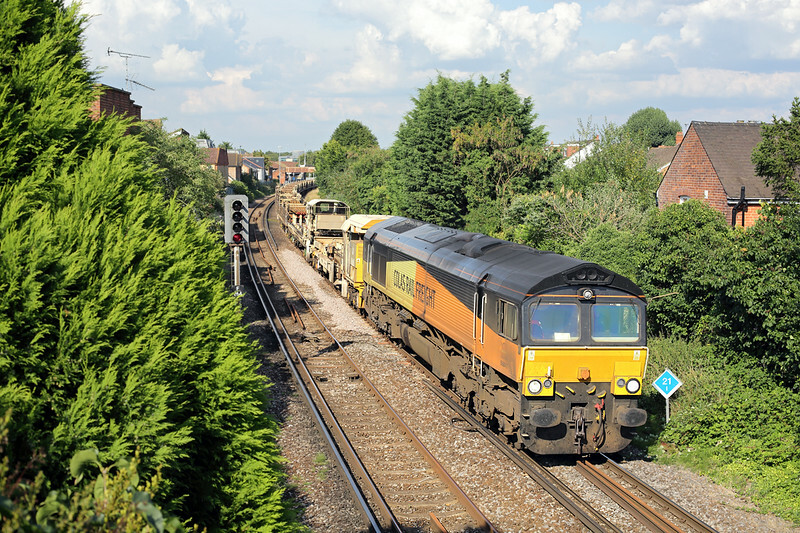 The hour ended up being barely enough as I noticed a GBRF coal train was due through so I went for a picture of that just south of the station. 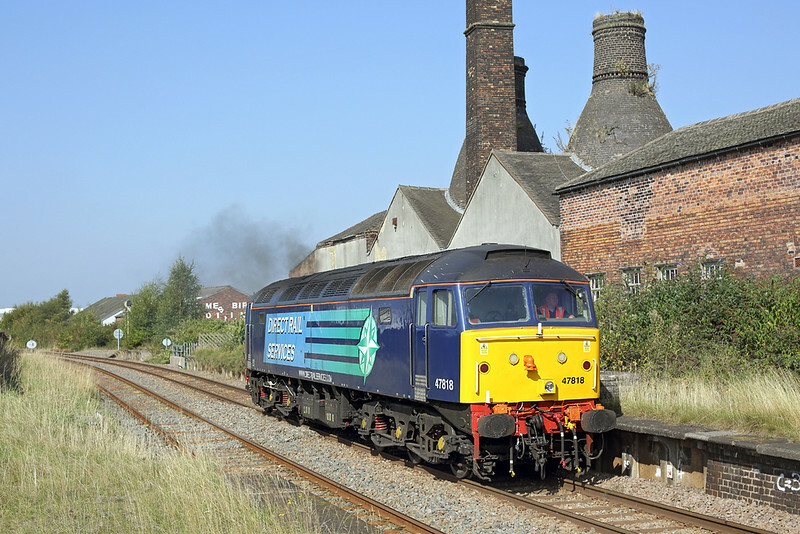 I unfortunately just missed a pair of Balfour Beatty Class 20s. By the time I got the train to Billingham the sun was starting to set. I used to have relatives in the town, which was the main reason for the visit to the North East in 1991. I don't remember much of the town from those days but the centre certainly appears to be a depressing place now. Billingham is not somewhere that is on my list of towns to revisit anytime soon! The final of my three trips was two days later. The now customary journey on the 0828 from Carlisle to Newcastle was made. This starts from Dumfries nominally as a Scotrail service though using a Northern Rail class 156 unit. It is one of a handful of services that run through from the Glasgow and South Western route to the Tyne Valley line; most are Scotrail trains running from Glasgow Central to Newcastle but two 'Northern' ones start each morning at Dumfries. Despite being Northern crewed and operated this service shows up as being a Scotrail train on the electronic station boards. 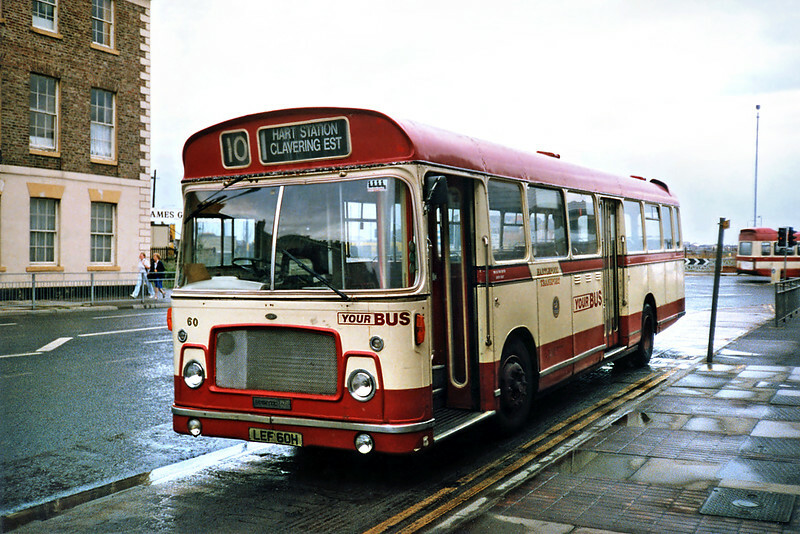 This day was very much bus based as it was the only way to get to the towns north of Newcastle like Ashington and Blyth. There is still a network of railway lines in this area but now only used for freight. 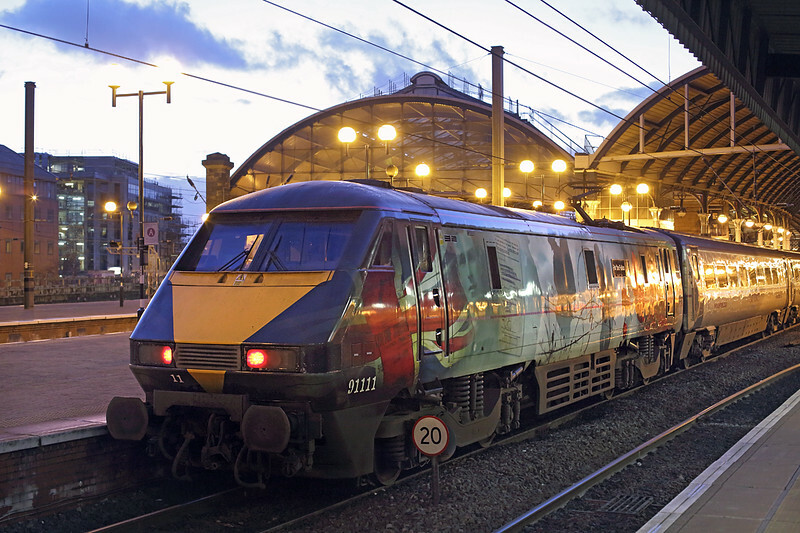 A long campaign has been underway to restore passenger trains to these lines; as it is at the moment there is a frequent network of buses linking them to Newcastle some running as frequently as every 10 minutes. 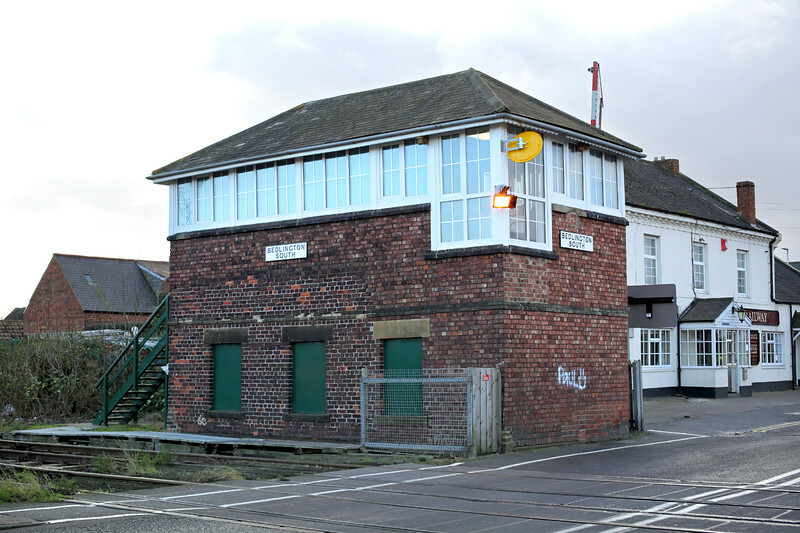 Every so often on these buses you cross the railway: one place I had to jump off at was Bedlington when I spotted a signal box; there turned out to be two (North and South) within about 200 yards of each other, protecting a junction and level crossings. The area they are actually situated in is officially called 'Bedlington Station' as Bedlington itself is about two miles away. Unlike similarly named 'Carstairs Junction' which still has a junction 'Bedlington Station' no longer has a station of course, though you can easily make out where it was once situated. Finishing the main bit of the bus journeys at Morpeth I had two options for returning. My original plan was to do the remaining Wetherspoons I needed in Newcastle City Centre then travel back via Carlisle whilst the other was to visit a new branch open in Spennymoor near Durham and return again via Leeds. I had to pick up a bit of time on my schedule to do this second option but that was a good idea as I could use my Arriva day ticket for this bit too and, as it turned out, I got home on time. The west had been suffering all day from gales and the West Coast Main Line had been effectively closed since dinner time north of Preston. I didn't find this out until I had already committed myself to the Spennymoor option, had I stuck to returning via Carlisle I would have literally been stuck! What may well be my final trip of the year was a day trip to London. Yet again this was for Wetherspoons, there are currently 128 of them in the Greater London area (as always this list is invaluable), and I now only have 7 to visit. The day was one of those really dull days where even if there is anything worth photographing you can't pluck up any interest to point your camera. I managed a handful of shots as I toured the South-West corner of the capital. 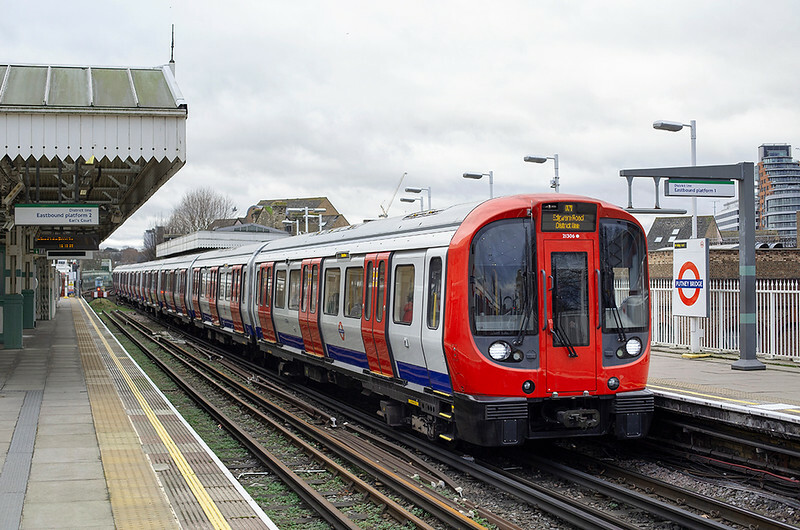 I would have liked to get a few shots of the District Line D78 Stock which are due to be withdrawn as the new Bombardier S7 stock arrives but the few times I went for a picture it was a new train that appeared. Travelling on the D-stock it was odd to think that there are plans by some to re-engineer these trains and add diesel engines to possibly replace the Class 142 Pacers in the North! After the first few pubs in Fulham and Putney that were easily reached by tube the rest of the day was mainly spent on buses going to the exotic parts of London like Tooting and Mitcham. 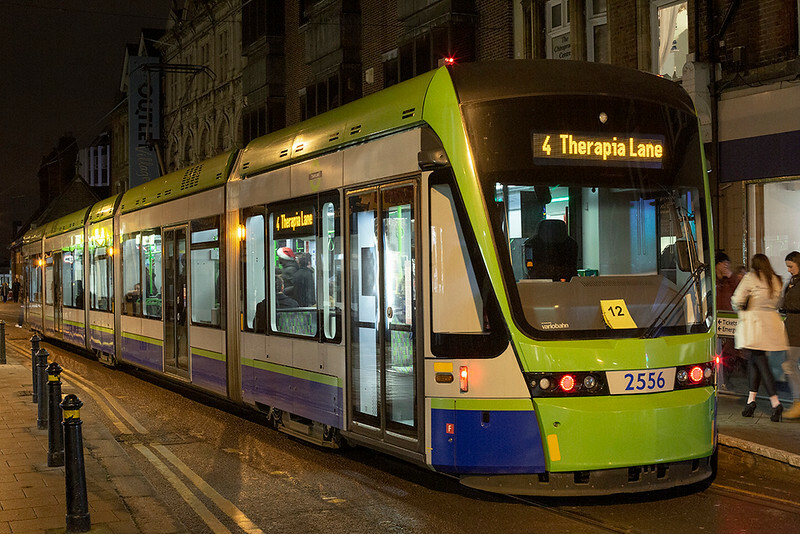 I ended up in Croydon where I would have liked to get a few shots of the Tramlink there but it was too dark, and frankly too busy with Christmas shoppers, to get more than just one shot of their fairly new Variobahn trams. With so few Wetherspoons to visit now in the capital hopefully my next trips can concentrate more on the public transport side of things rather than rushing round pubs! I'm not sure if I will get chance to get out again this year, tomorrow being the last day of the Northern class 47 hauled specials for Christmas Shopping in Manchester so I might try to get a picture or two if the weather is reasonable, anything else I will leave until my next blog which I'm sure I will get round to writing some time in January. As always thanks for reading not just this edition but all those over the last three years. A merry Christmas and good New Year to one and all, hopefully in the new year we might get some snow to enable me to get some more pictures of trains in it as I'm running out of suitably wintery shots to make into Christmas greeting 'cards'. Here is one from Christmas Eve 2010, one of the few Christmas's I can ever remember that were actually white! Bye for now. 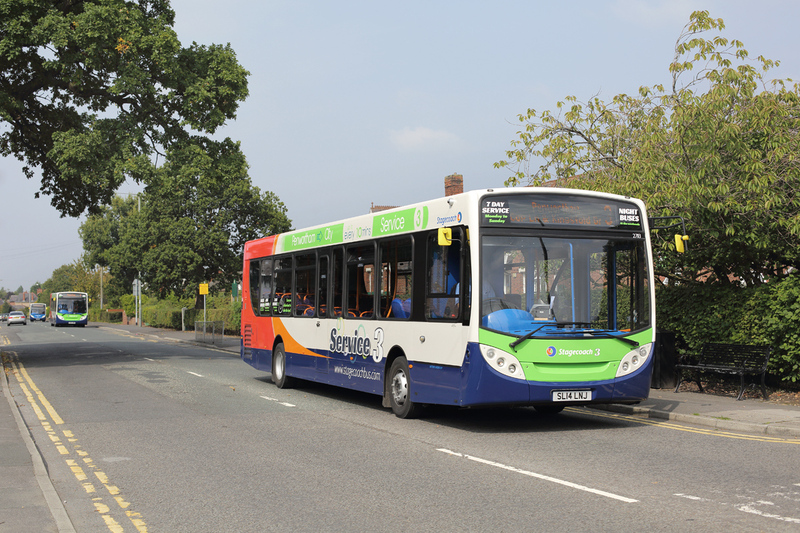 62: From Haverhill to Humberside, Cleethorpes to Chorley, Chester and Clacton too. 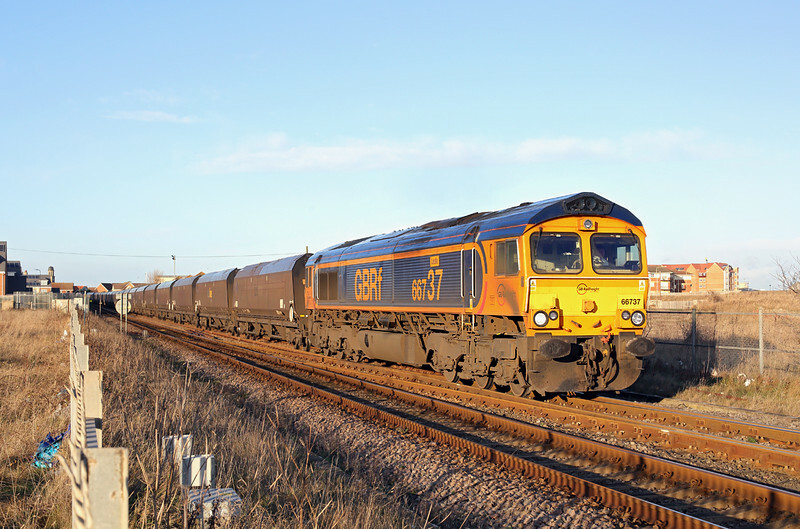 A warm welcome to edition 62 of the Railwaymedia blog, and warm it needs to be as its a bit nippy outside with the first real frost we have had this year. I should really be making the most of crystal clear winter sunshine outside by going somewhere with my camera but I have been putting off sitting down to write this for too long: November was the first month since I started my blog that I haven't managed to squeeze some kind of rambling essay out. So I had better start this one now! 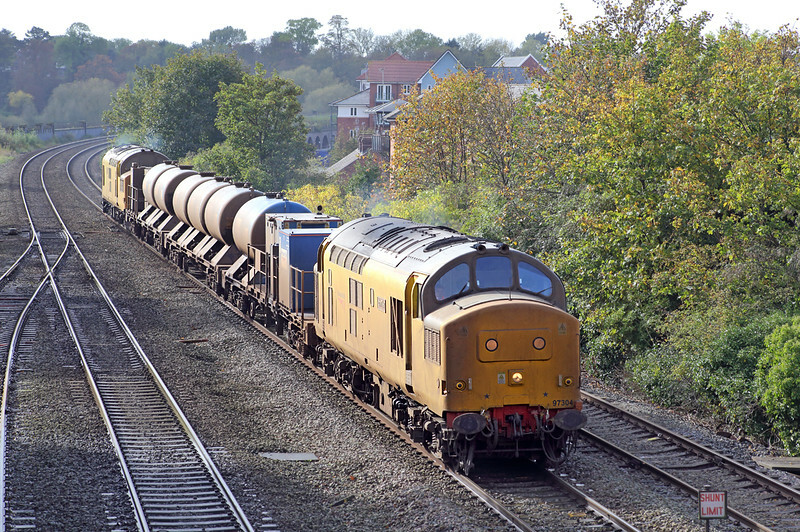 The highlight of autumn is always the annual Rail Head Treatment Train (RHTT) season when Network Rail sends out various Water Cannon trains over the system to blast the fallen leaves off the track and help to increase adhesion between the wheels and the rail. Forget the Press and its perennial jokes about 'leaves on the line'; it is a serious problem and Network Rail chuck a serious amount of money each year into trying to prevent trains sliding past stations and signals. 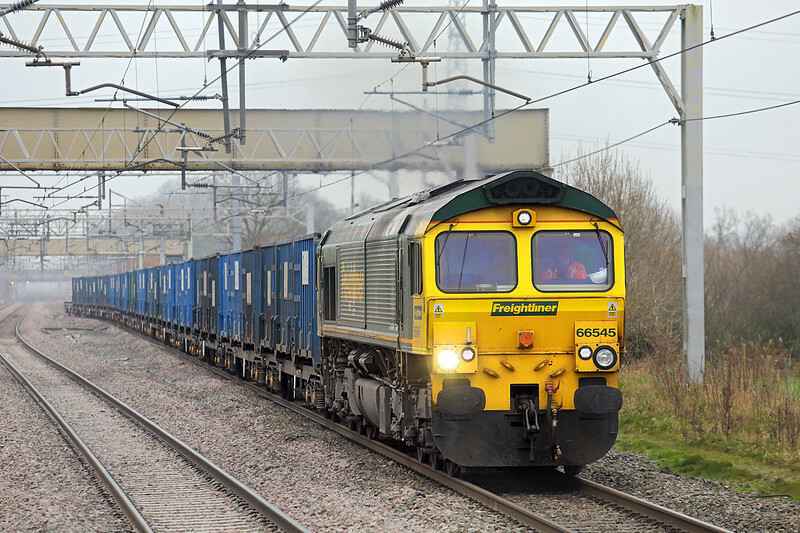 As is usual various types of engine and track machine are used in different bits of the country, the one that covers Mid and North Wales usually uses Network Rail's own class 97 diesels (former class 37) as they need to have the new ERTMS In Cab Signalling installed to traverse the lines west of Shrewsbury. Most of that section is done at night but usually the trip to Holyhead and back from Crewe is undertaken during daylight, it is seen above arriving into Chester. East Anglia is another area where interesting locos can be seen on these workings with the last few years DRS providing several trains based at Stowmarket. I had a few branches of Wetherspoons to visit in the Colchester area so tried to tie them in with a couple of shots of the RHTT that covers Southend Victoria and Clacton. I ended up with two hours at Wivenhoe just south-east of Colchester to get a picture of it going up and back the Clacton branch. There was a nice location 15-20 minute walk from the station back towards Colchester along the side of the River Colne. I am lucky to still have this picture. My camera dropped out my bag at Basel Airport in September damaging the hatch to the battery compartment. I shoot in RAW but as the camera was saving the file of this shot the battery must have become loose and so corrupted the image. Not one to be held back I looked into things and fortunately a JPEG is saved first in the RAW data so with the correct program, I used Irfanview, you can obtain that JPEG even if the entire RAW file isn't there. Of course it's sods law that this happened on the principle shot of the day as it has only done it once since, but at least something got salvaged! No such problems with the returning working. Having been to Braintree on my Colchester trip I had hatched a plan to visit the Wetherspoons at Saffron Walden and Haverhill. They aren't too far from Braintree by road but since the Beeching cuts there is no railway so they needed to be attacked, as it were, from the Cambridge side. This was never going to feature many rail pictures, in fact not many pictures at all, with most of daylight hours taken up travelling on buses between the towns rather than wielding my camera. Haverhill is a quite large place now, one of many where had the railway remained open another 10 years (only the section from Marks Tey to Sudbury remains) it would have once again become useful, though presumably mainly as a means to get out. Saffron Walden is a much nicer town, again its station closed in the 1960s although this was just a loop off the main London Liverpool Street to Cambridge line. 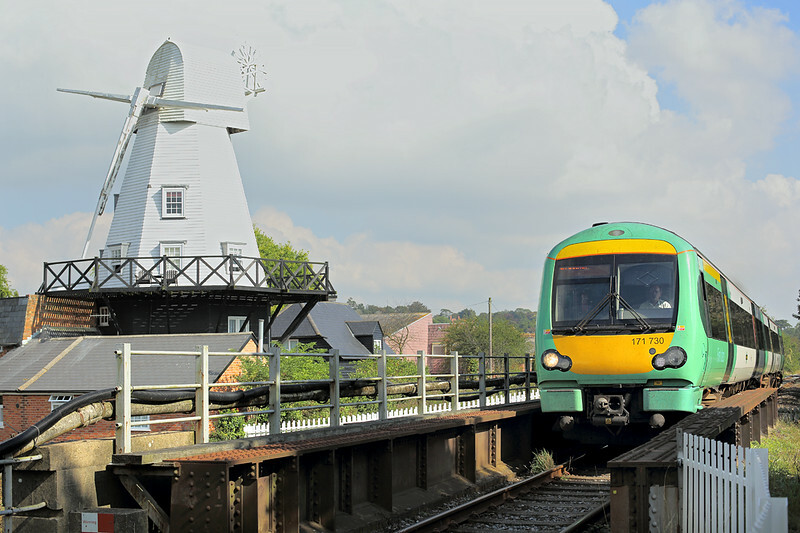 The town itself is only about 2 miles away from the present station of Audley End. OK if you have a car but with only one bus an hour not much use otherwise. Featuring a mix of street running and segregated running it has extended the network to almost 60 miles in total, though until the second route through Manchester City Centre is opened trams from the Airport are only going as far as Cornbrook for onward connections to prevent tram congestion between there and Piccadilly. As with other routes trams run every 12 minutes. Humberside was my next destination. I had hoped to again mix a bit of Wetherspooning with a shot of the local RHTT before the season finished, class 20s supplied by DRS have been featuring on a diagram working from York. Twice now though the day I could manage has been one of the days the circuit doesn't run to Grimsby, which appears to only occur on alternative days. 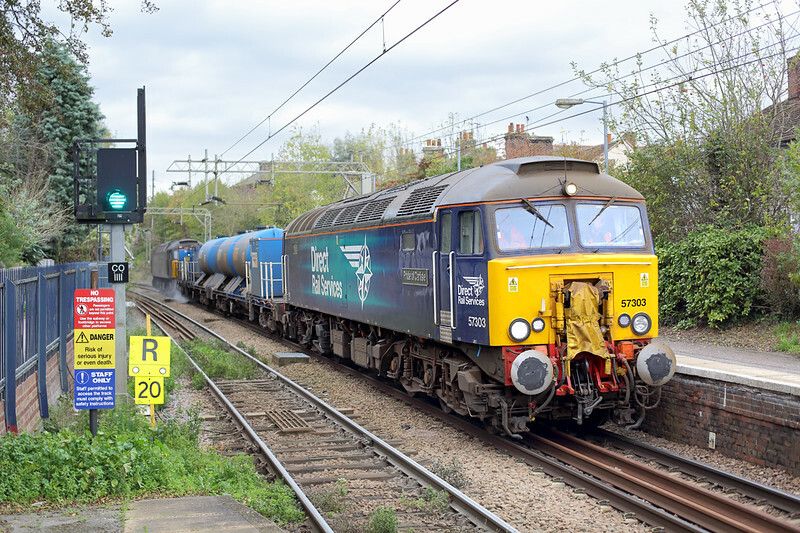 To fit all the pubs in I wanted to visit plus a bit of 'line bashing', travelling two routes I've never been on a train over, took a bit of doing but I got an itinery worked out with even the prospect of a picture of a freight and a Network Rail test train. 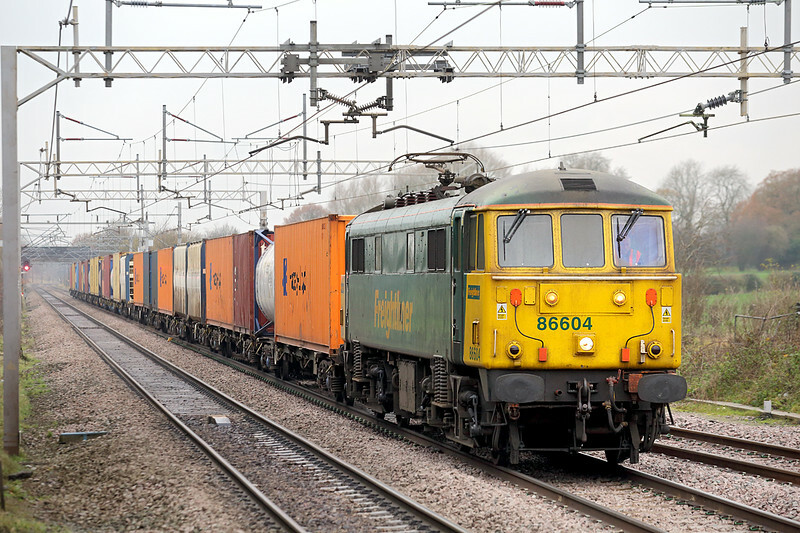 Of course the freight turned out to be a light engine and the test train was just Network Rail's unique class 950 Sprinter unit but, hey ho. 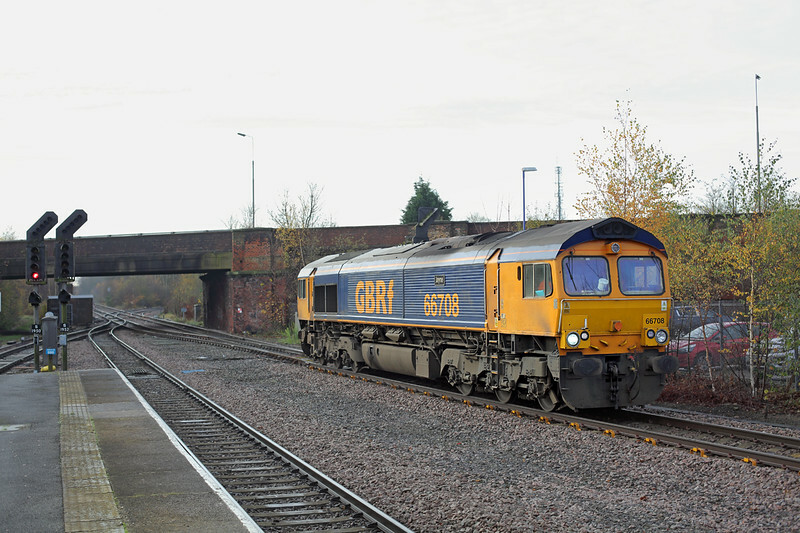 Selby was the first destination and 66708 was the light engine. I suppose if I had looked at Real Time Trains closely I would have realised that it was just going to be an engine. I blame the excitement. In order to do the Barton-on-Humber branch and to save time I went via Hull and used the half-hourly Fast Cat bus service over the Humber Bridge. The bus was a bit late leaving Hull meaning I was a little worried at missing the once every two hours train. The train ended up being almost 30 minutes late anyway due to a road traffic collision conveniently in the middle of one of the busy level crossings in the centre of Grimsby blocking the line whilst an ambulance attended. I had though left myself plenty of time in Cleethorpes to have a few beers and photograph the test train. My plan was to get off at New Clee, the stop before and to walk to a footbridge for photographs of the test train arriving and departing however I hadn't bargained on it being a request stop and the train sailing straight through! In the end it didn't matter with the test train being the Sprinter rather than a loco hauled one, and it went into the 'wrong' platform for a decent picture. I returned from Cleethorpes via Scunthorpe and Grimsby, two towns not especially on my list of must-visit-again places. I had time for some tea in the Grimsby Wetherspoons before my ride back to Leeds which was the 1849 via Knottingley, a route that only has three passenger trains a day over the whole length: 0704 and 1849 Goole to Leeds and 1716 Leeds to Goole. Presumably any commuters finishing at five need to finish work on time and rush for their last train home! 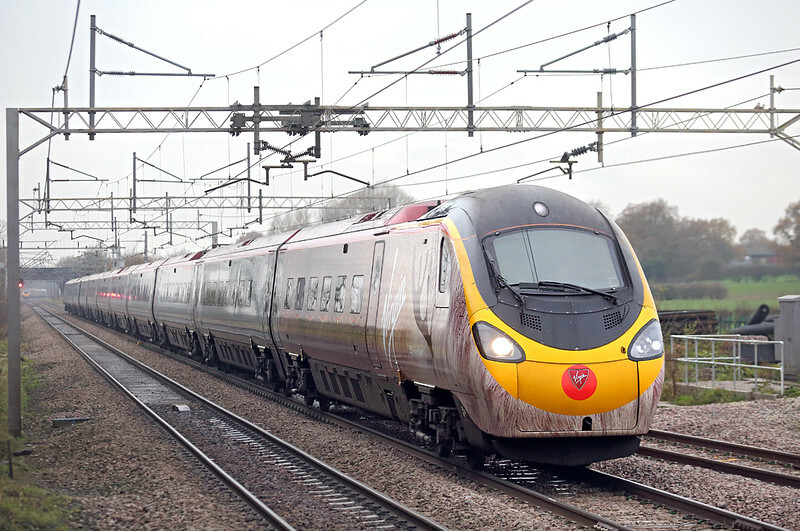 There were about 9 freight trains in total in just over an hour which is pretty good going, and I even got to see Pendolino 390112 which for December will be a bit of a celebrity as it has had its two driving cars at either end vinyled up as a 'Traindeer'. 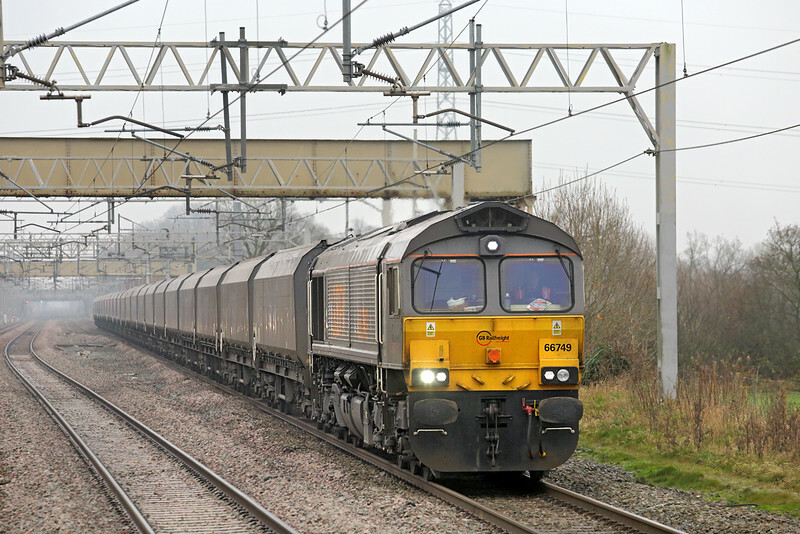 I'll put a picture of that at the bottom of the blog but for now here's a picture of 86604 on a Garston to Crewe Basford Hall Freightliner also seen that day. A slightly early happy birthday to it: one of only two class 86s left running (the other being 86610) with a build date of January 1965, it will be 50 years old next month. There were two bits of excitement in the North West this last Saturday. 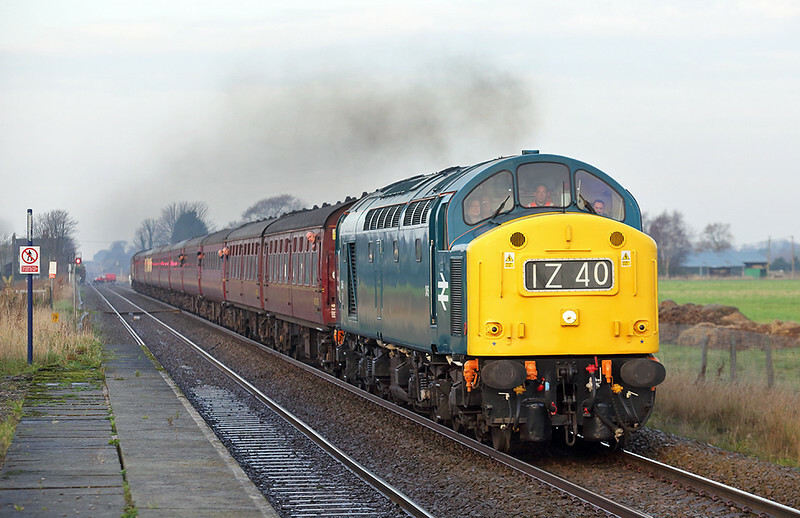 First was 40145 which was doing a railtour from Southport to York and beyond. 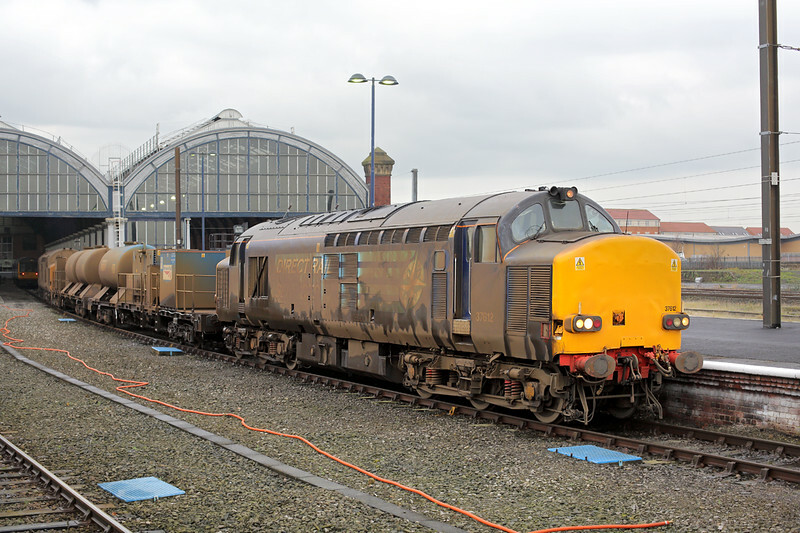 It is many years since a class 40 has visited Southport so it was too good an opportunity to miss to get up early and drive over to the Southport to Wigan line at Hoscar to see it pass. Annoyingly another 10 minutes would have seen the sun rise high enough above the early morning clouds that were hanging over Parbold hill. The other railway fun in the area was the loco hauled shopping specials being run by DRS for Northern Rail. Christmas Shopping and the now obligatory German-style markets make trains into Manchester far busier than they normally are. Most trains into Manchester from Preston are full and standing all day as it is, even mid-week, so Northern decided to lay on relief trains. The first week of operation was 22nd November with 47818 and Northern Belle 47790 in charge and run each Saturday until Christmas. 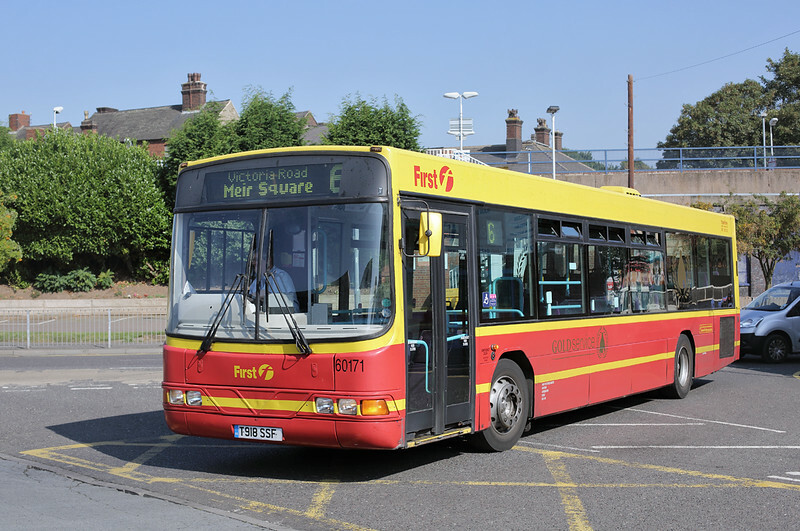 Whilst they all operate between Preston and Manchester Victoria, in order to stop overcrowding not every journey is in passenger service throughout with many starting or terminating at Buckshaw Parkway or Chorley. Last Saturday again saw 47790 and 47818 in charge, though on opposite ends of the coaches than the previous week. 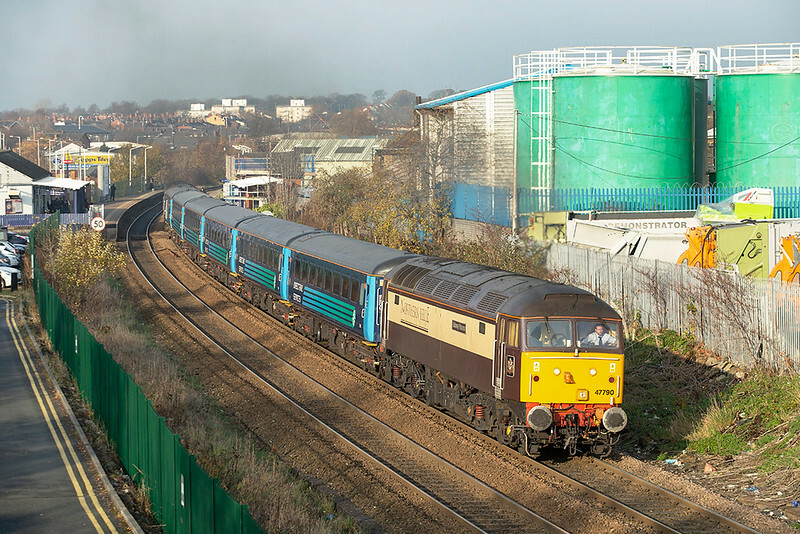 There are rumours class 57s might be used once they return from RHTT duties. A list of times is below. Finally I think I've caught up with everything important since my last blog, I've omitted a lot about buses to shorten it slightly, the scans of buses from 1991 and 1992 I have managed to process during this period can still be seen HERE for now, please check my New Additions section for any days out I manage to squeeze in during the next two or three weeks, alternatively check back on my blog as I shall try to find the time to write one more before the end of the year. All that remains to be said is thank you for finding time to read this, I shall leave you by trying to make you feel slightly festive with a shot of the 'Traindeer'. Bye for now! 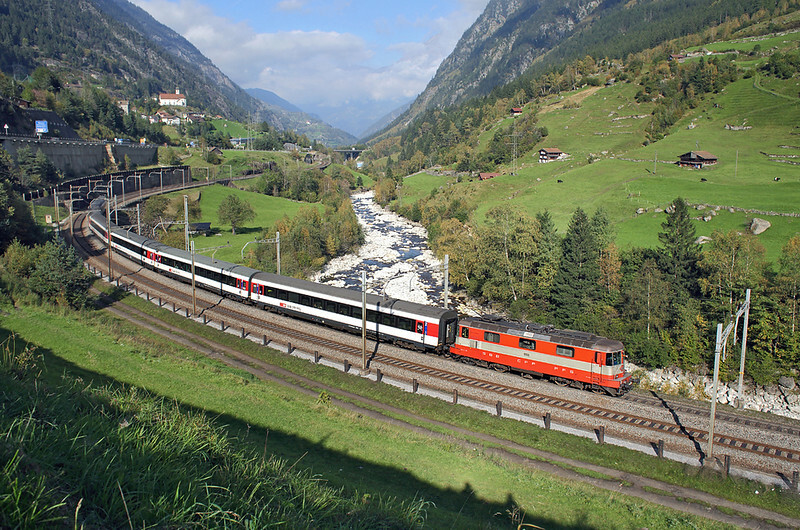 Welcome to the latest installment of the Railwaymedia blog, this one as promised will cover my recent trip to Switzerland to view, possibly for the last time, the stunning Gotthard route. 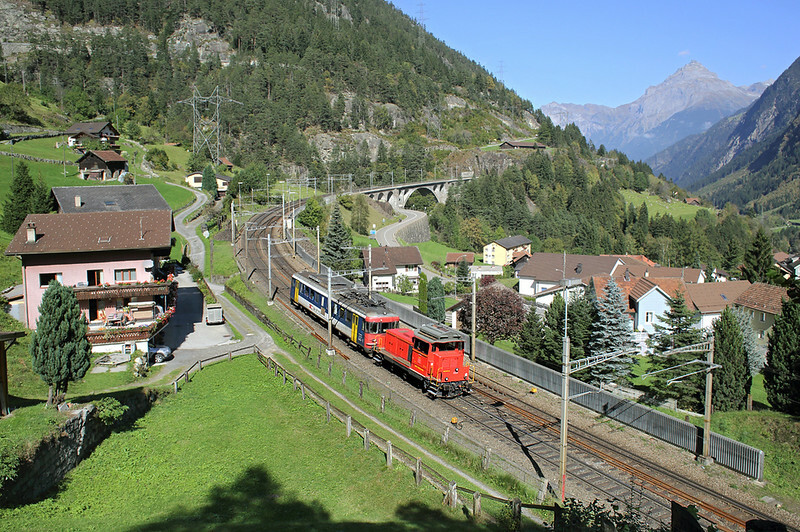 The railway linking the German and Italian speaking parts of Switzerland currently winds up the valley from Erstfeld to Göschenen before passing under Andermatt in the 15km long Gotthard tunnel. In 2016 it is planned that a new 'Base Tunnel' will be opened cutting out the entire route through the valleys either side of the old tunnel and creating the world's longest rail tunnel at 57km. With the Base Tunnel itself basically complete, just needing track and wiring, there is only a year or so in which to view the busy old route and its procession of passenger and freight trains. 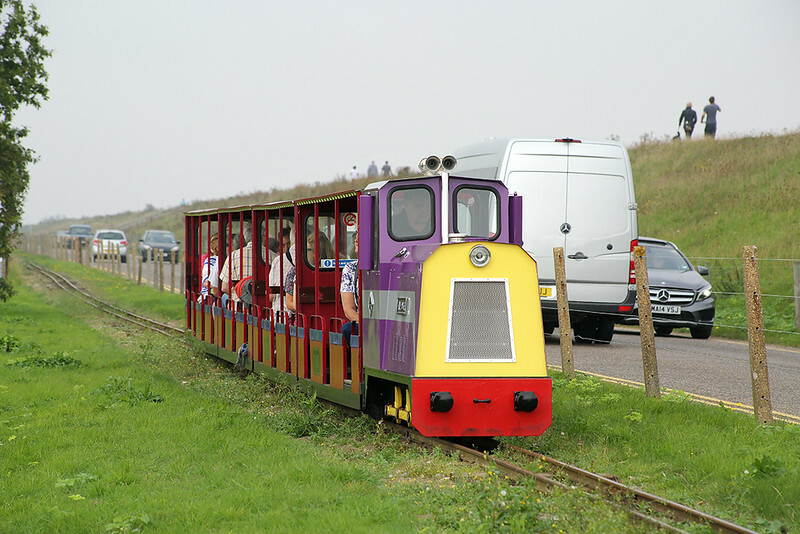 Hopefully this edition of the blog will encourage you to visit the line next year in what will probably be the last full year before it is reduced to a secondary line with probably just a local passenger service. With a flight into Basel arriving early afternoon I only had time on the first day to spend an hour or so in the City Centre photographing the trams. 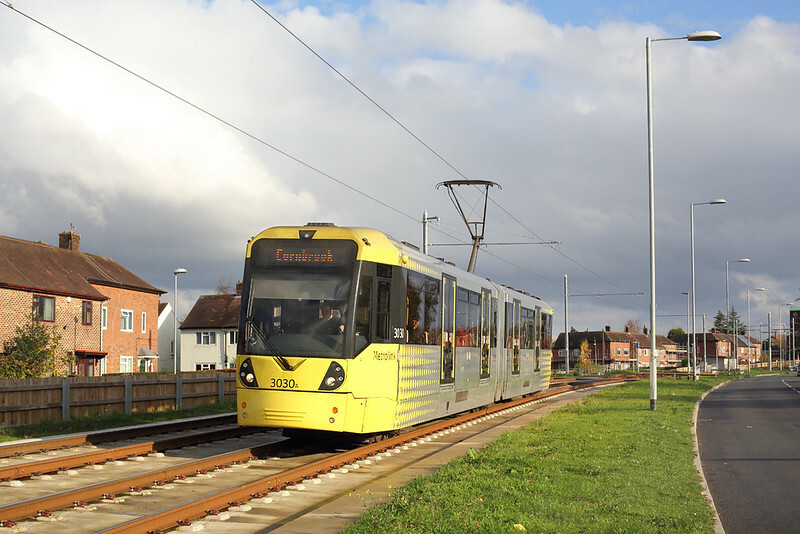 There are a few different makes of trams to be seen with two operators, BVB which operate in a green livery and do more of the local routes, and BLT operating in yellow and red and which runs some longer routes to outlying towns. Before my train to Erstfeld I stocked up on beer at the excellent beer shop located on the SBB station, it is a two and a half hour journey by way of a reversal at Luzern and the journey flew what with decent beer, comfortable train and stunning scenery. 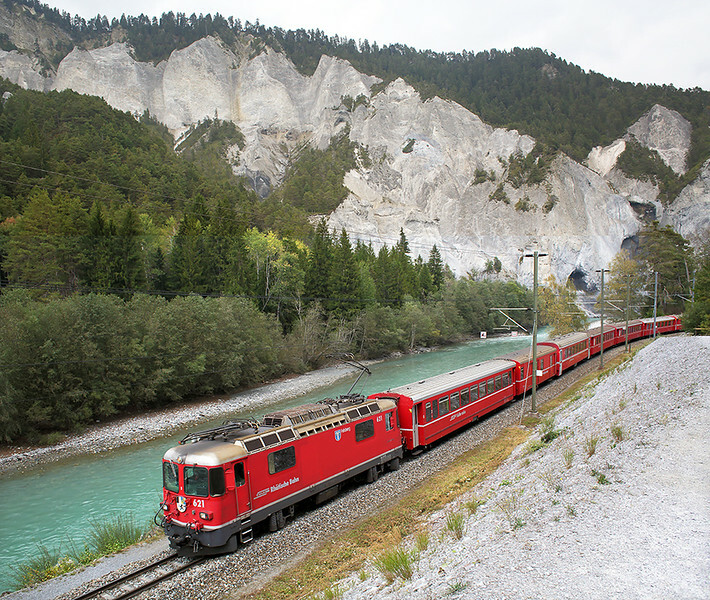 Lucky too to have the classic Swiss traction of their standard Re 4/4 Electric locomotives hauling the train for both sections. 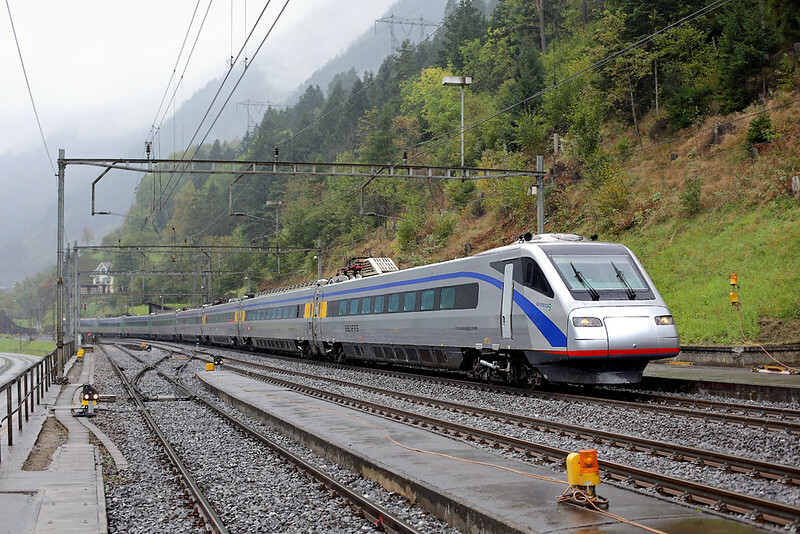 Over the Gotthard route there are up to three trains an hour; there is an inter-regional to Locarno, an inter-city to Lugano, and a Pendolino to Milan running generally every other hour. 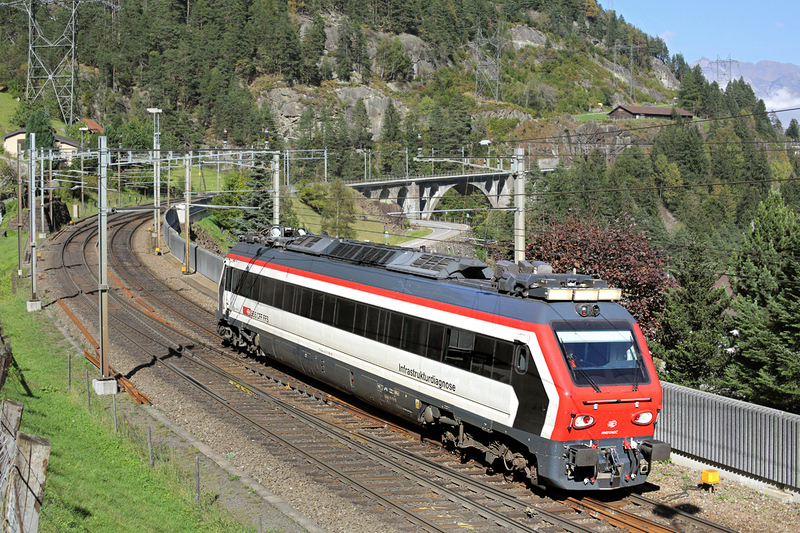 The Pendolinos all originate in Zürich but the IR and IC trains alternate between Basel and Zürich with them both meeting at Arth-Goldau to allow cross-platform connections. That is how to run a railway! On my last visit both these services were loco hauled but now only the IR's are, the ICs are covered by SBB's class 500 tilting units. I expected as a result most locos to now be the newer Class 460 Lok 2000 type engines but I was pleasantly suprised that most were still Re 4/4s. Whilst the trip was organised around just myself and my friend Richard, two others were meeting up with us on the Tuesday to see the Gotthard for themselves. The weather wasn't great but we still went to show them the classic locations of the line, starting with Silenen. This is the first large village up the valley from our base at Erstfeld. 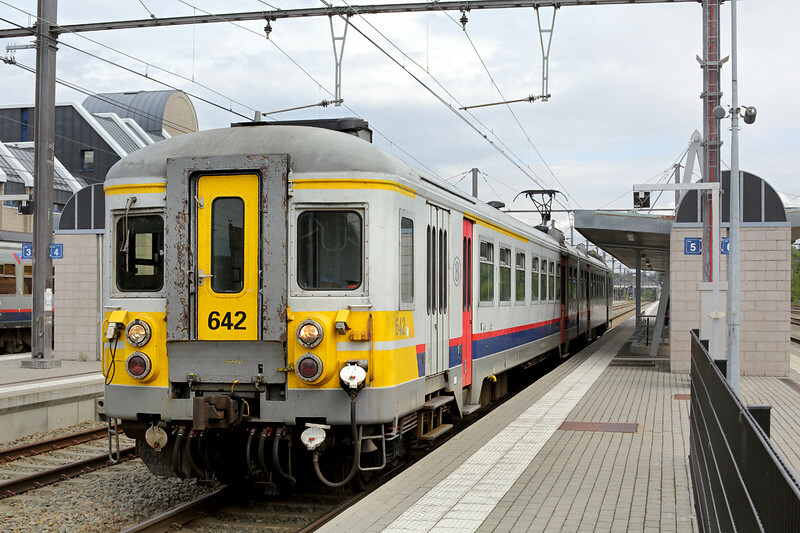 There is an hourly bus that runs alongside the line from Erstfeld to Göschenen; Inter-rail and certain other railway tickets are valid on the bus as it serves the places where SBB has in the past closed the stations serving the villages. For this location at Silenen you alight the bus at Silenen Dägerlohn. Continue walking along the main road up the valley for about 500m, past the Post Office, then turn left up a footpath that takes you under the railway. Turn right at the top and you are on the road that turns parallel to the railway, as seen in the picture above. If the sun is out then it is best to visit here in a morning. After a few hours at Silenen we caught the bus again up the valley to Wassen. It is about 25 minutes ride between the two; Wassen is perhaps the classic location on the route. As the valley rises faster, despite the lines gradient, than the railway can climb, at two points on the 'north ramp' the line has to spiral to gain height. 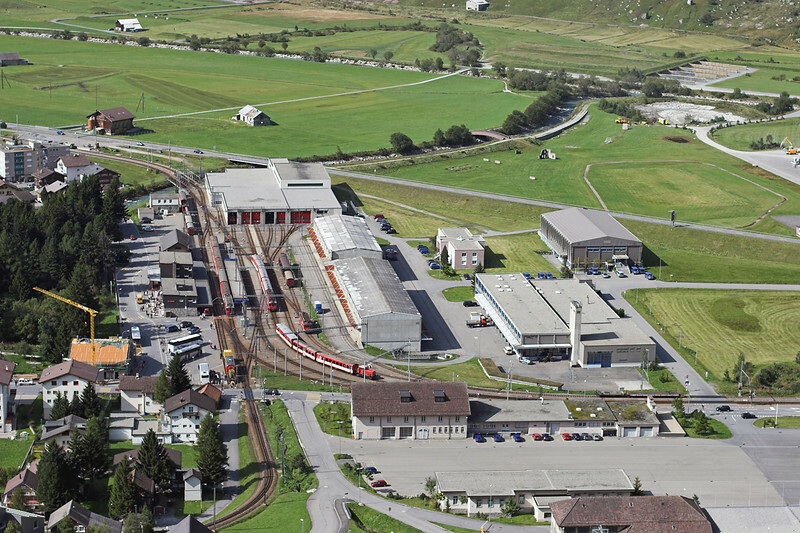 The first is at Grünellen where it does a simple spiral, the second is at Wassen where it does two 180 degree turns (actually the first is almost 270) and so passes through Wassen on three seperate levels with the station and village being on the middle tier. Previously I had only done the bottom location so wanted very much to try the others. It is a bit of a climb to the very top but as can be seen above it is worth it! Again if the sun is out then this would be best probably from late morning for a few hours before the sun becomes head-on. To reach this place you take the only road climbing west out of the village and after 200m take a small lane on the left that takes you under the (middle) railway. Immediately through the bridge there is a track on the left, simply follow this all the way up the hill, it zig-zags up the final bit, until you reach a tunnel mouth on the top level. There is a well worn path alongside the railway. From this location you get a fantastic view of the railway on all three levels looking down into the valley; a train appearing at the bottom will take about 6 or 7 minutes to reach you at the top with it being visible half way up too. To illustrate a little HERE is a stitched view showing the top two levels. We had planned then to show Tim and Mark the classic bottom shot, however a sudden deterioration in the weather meant we had to shelter in the old station on the middle level enroute. The station is easy enough to find being on the main road through the village just south of the centre. Continuing past the station you will come to a steep farm track on the left that descends below the motorway and through a long curved tunnel. This is the route you take to reach the main afternoon spot where the lower section of track turns out the valley straight into the hillside to do its first full turn in order to climb to reach the station. The picture at the very top of this blog is the view from this location taken on the Thursday when the weather was very slightly better! The next day we planned to do a longer trip having a day away from the Gotthard, and intended to head to Chur to see once again the excellent narrow gauge Rhätische Bahn. 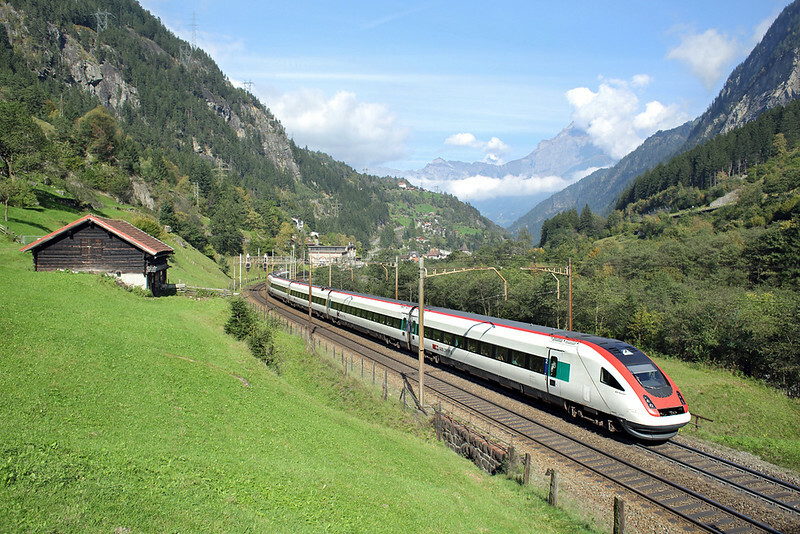 The quickest way to reach there from Erstfeld is via Zürich taking about 2 and a half hours but a far more pleasant way to reach it is by using the Matterhorn-Gotthard-Bahn (MGB). Catching the train up the valley from Erstfeld to Göschenen you change there onto the rack railway to Andermatt. 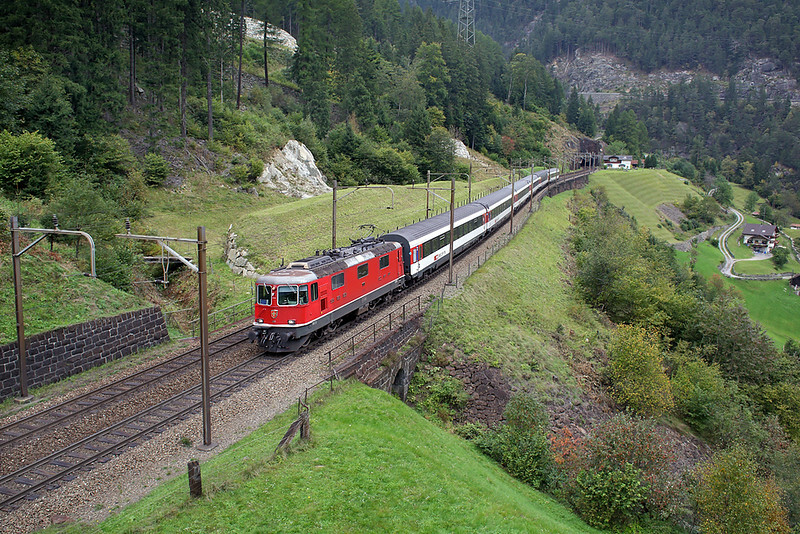 This climbs very steeply (HERE is a picture of a MGB train leaving Göschenen) through the Gotthard Pass, from where the mainline and tunnel takes its name. On my last visit I failed to get the picture from the train of the Devil's Bridge half way up (pictured above), but was a bit quicker at remembering this time! Changing at Andermatt the main route of the MGB heads either direction to Brig and Visp in the west and up via Oberalppass to Disentis in the east. This latter is the route to Chur. Unfortunately the low clouds obscured the view of Andermatt from the train as it climbs to the 2048m high Oberalppass; we had better weather in 2008 and this picture below shows what you can see as the train climbs, you can make out at the bottom the start of the line this was taken from curving to the left away from the station and depot on its 600m ascent from Andermatt to the summit. I managed to cover reasonably well the MGB and its trains in 2008 with a day spent at Oberalppass photographing the Glacier Express portions. There are usually two seperate Glacier Expresses in each direction. During the summer months as these have more coaches they have to each run as two seperate portions over the steeply graded MGB so eight different workings can be viewed at Oberalppass within just over two hours. The day I spent there can be seen HERE. 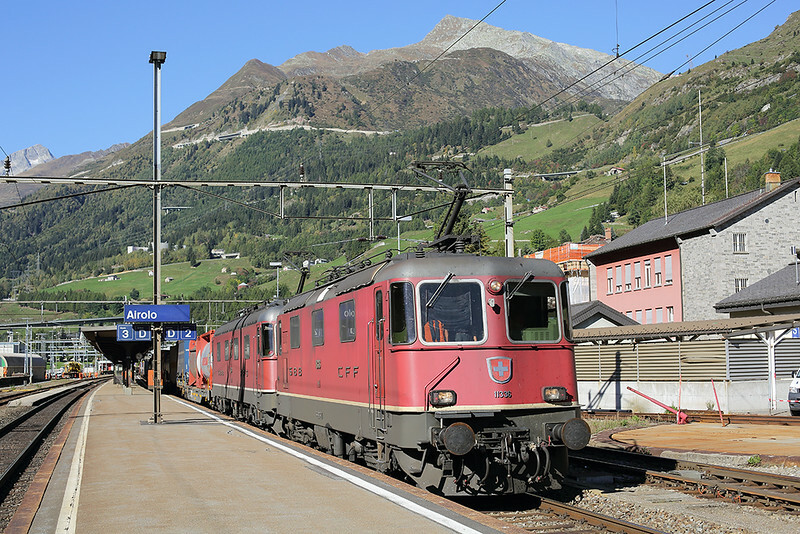 The main purpose was to get to the Rhätische Bahn so we stayed on through to Disentis where a cross-platform transfer is made onto the waiting RhB service. 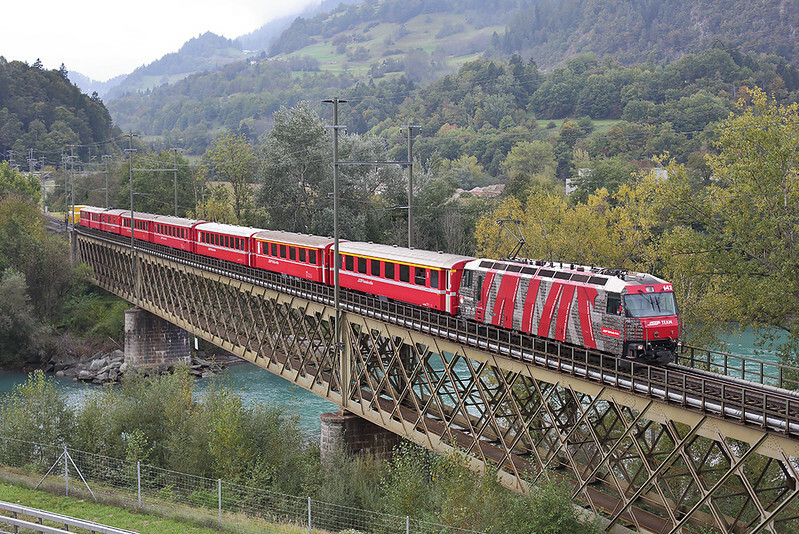 Whilst the RhB have bought a few new units in the last few years they have largely replaced older EMUs, the main exception being the locos on the Chur to Arosa line. 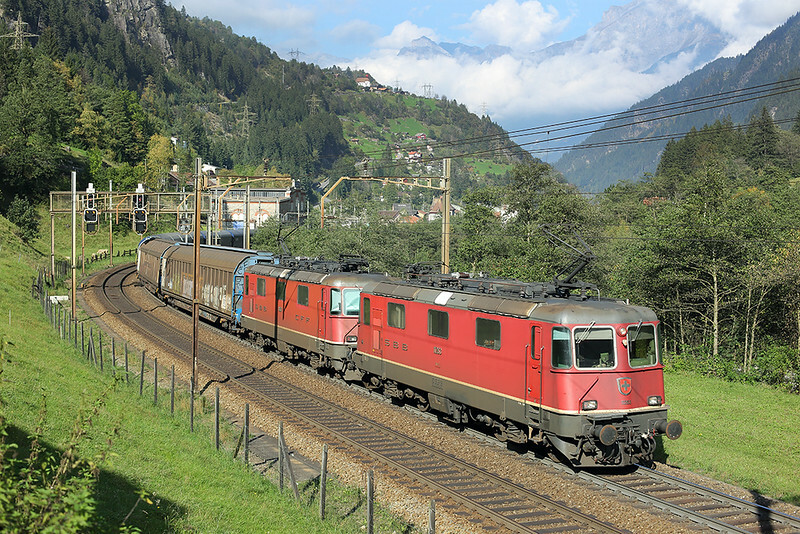 Fortunately two major loco hauled routes still exist, that from Disentis through Chur to Scuol Tarasp and from Chur to St Moritz, both running hourly. 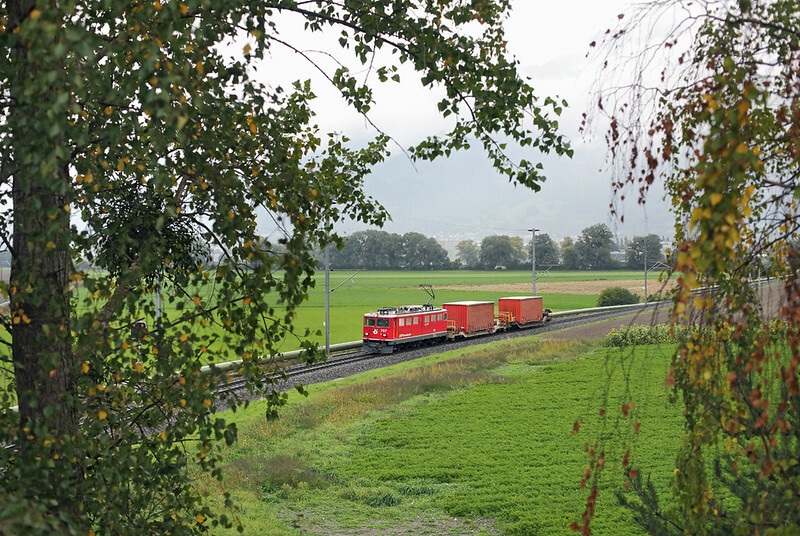 These two routes meet at Reichenau Tamins. 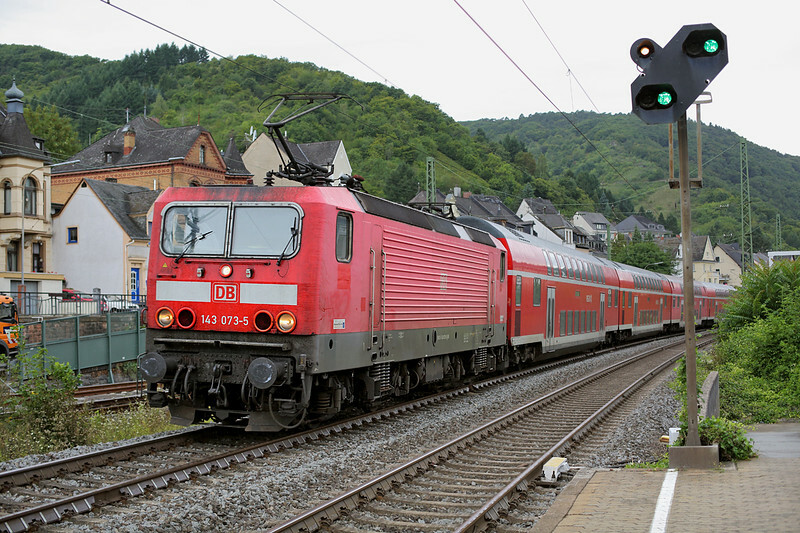 There is a good location to the west of the station (above) where the line crosses the point where the Vorderrheine and Hintererrheine rivers meet and form the River Rheine itself. Before we reached there we stopped off at another classic location, Versam-Safien, where the Voderrheine passes through a spectacular gorge. I had been half tempted to spend the day, given the poor weather, travelling on the RhB as it possible to do a circle from Chur via Filisur, Davos and Klosters but that would have taken me all day and so I went for my original plan of visiting the section of the route between Chur and Landquart where it runs parallel with the SBB mainline. This is nowehere near as interesting as the mountainous bits to the west and south but I had found using Google 'Streetview' a reasonable location at Zizers. Unlike Britain, Switzerland hasn't allowed Google to map all its roads with car mounted cameras however the RhB has allowed them to set up a camera on a truck and has toured all the RhB routes, which can now be seen on Google streetview! The view of the bridge at Zizers I went to is HERE. I was starting to get a bit cold and wet by this point but it was worth a walk up to the bridge as there are good views either way (a zoom lens would be useful) of both the mainline and the Rhätische Bahn. 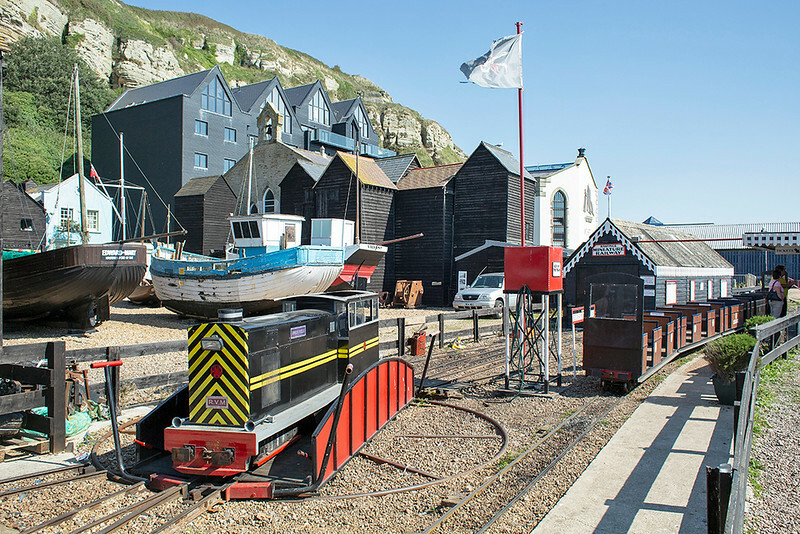 There is a fair bit of freight on the RhB, generally running to set timetables. I'm sure these are available somewhere but I wasn't aware of the times so getting a couple of pictures was a matter of luck. 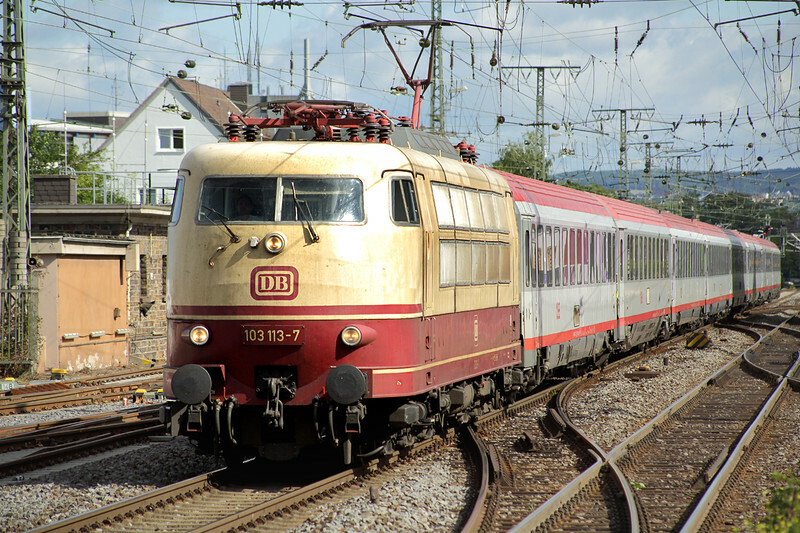 Most of the RhB engines are of two types, the older Re 4/4s pictured above and the newer design as seen in the Reichenau-Tamins shot. They also have a handful of Ge 6/6s designed more for freight work, one appeared heading towards Chur with a slightly untaxing load. We woke up Thursday morning to blue skies over Erstfeld, although with the sun not yet penetrating the valley. As I had never visited the 'south-ramp' the other side of the Gotthard Tunnel we caught the train through to the other side. The valley the railway runs down is quite a bit different to that on the north side, not withstanding the place names all sounding Italian. We weren't really sure of any decent locations for photography so caught the train two stops to Faido. With a centre platform and the sun worng we quickly caught the train 15 minutes later back up the hill to Airolo which, like Göschenen to the north, is at the end of the tunnel. As such there is a fire train stabled there for emergencies, there was also when we arrived a diesel shunting trucks round the station area. The platform again was central which wasn't ideal but the sun was good for southbound trains. 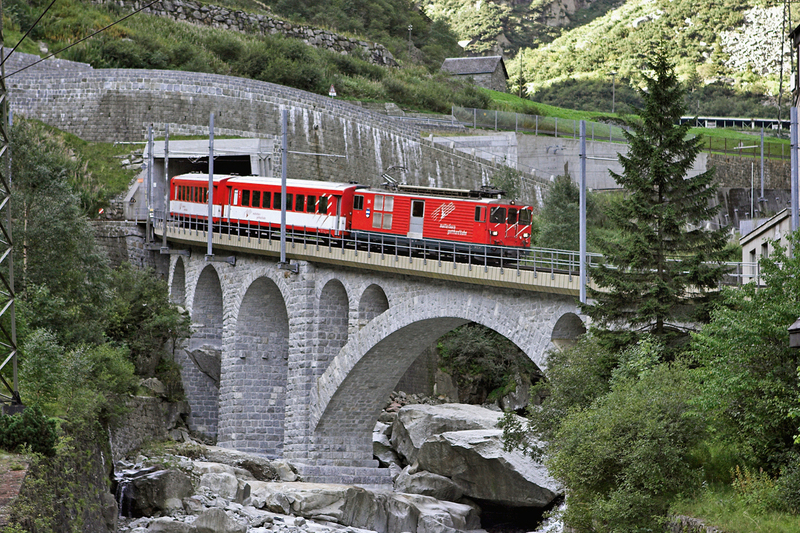 The road you can see zig-zagging up the mountain behind the train is the other end of the Gotthard Pass and takes you to Andermatt then back over the Devil's Bridge down to Göschenen, a slightly longer journey though than the direct 15km tunnel the trains traverse! Rather than waste the sunshine trying to find any locations this side we returned through the tunnel to Wassen. We went to the top location but the sun was already starting to get head on. I found a decent spot half way down the path for a view of northbound trains on the middle level through the village and spent an hour there before moving on to the main loacation at the bottom. Two oddities passed whilst I was waiting there, one was a single coach infrastructure diagnostic EMU and the other was this diesel shunter which for some reason was pushing an old EMU coach uphill. Having bought a few beers from the convenient supermarket in Wassen village before I climbed up to the top level, I think I bemused the woman by buying some more two hours later enroute to the lower level. We had done the classic Wassen shot in 2008 but with perfect weather it needed to be repeated one last time before the Base Tunnel opens, though being October the shadows from the steep valley sides meant we lost the sun early so retreated to the excellent bar in the village. The best shot of the day was of heritage livereied Re 4/4 number 11108 on an inter-regional service. The final day our flights weren't until late from Basel, mine back to Manchester not until 2130, so we had a full day to spend somewhere. My initial plan was to work my way to Basel covering one or two railways I've not yet photographed; there are many in Switzerland! 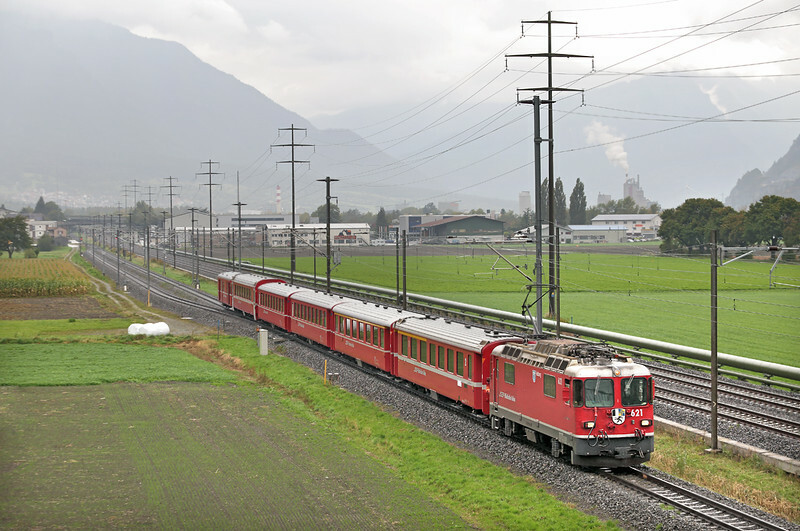 It was again blue sky when we awake in Erstfeld so Richard decided to head up the valley again whilst I caught the 0832 train towards Luzern, planning to make an initial stop in Arth-Goldau to see how restoration of the wooden station of the Rigibahn spanning the mainline was going on. The further north I got though the murkier it became and Arth-Goldau was almost foggy and pretty cold. The Rigibahn is a rack railway, the first in Europe, that climbs from Arth-Goldau to the top of Rigi Kulm (1752m) with a second line that goes down from there to the shore of Lake Lucerne. 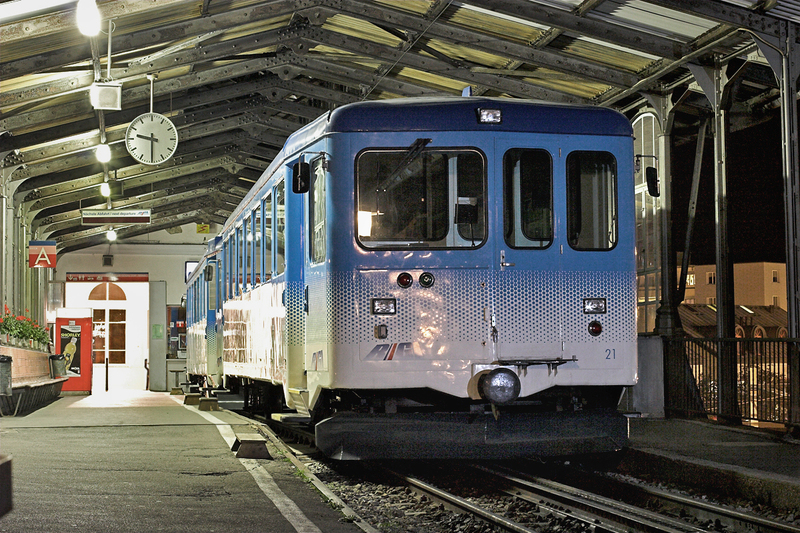 The old station is still being restored, the interior of which trains used to stable at night (see picture HERE), and what at first looks like a temporary station is now situated just outside, though the massive concrete stop blocks suggest it is not temporary and it is awaiting buildings. There is actually another temporary station in use further up the line past the workshops and shed. With the weather looking no better I decided Richard had had the right idea so caught the next train back to Erstfeld connecting onto the bus towards Silenen. The sun had apparently only reached the level of the line at about 1000 so I hadn't missed too much with my diversion to Arth-Goldau. Having done the main Silenen shot before I got off the bus two stops early to try a different location, a small road bridge. The curve of the line, the cutting and the nearby barn is not ideal but at least it was a different view looking down towards Erstfeld. I believe there is another location, probably best in summertime, beyond the bridge in the distance, so a friendly local told me. 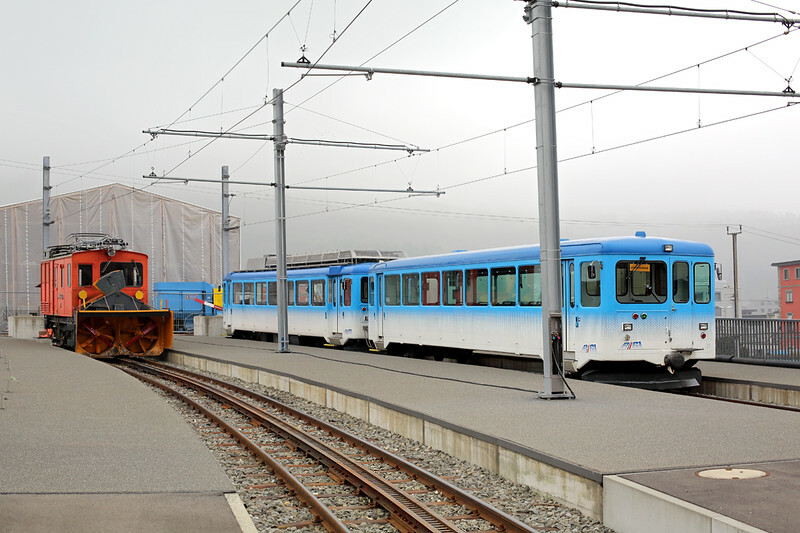 The locos pictured here are brand new Bombardier Traxx engines to an updated design, owned by Railpool and leased to BLS. They are of course electric locomotives but also have a small diesel engine fitted for working in sidings and yards that don't have overhead wires. By the time I reached the Silenen location Richard was ready to move on. He headed back to Wassen I had another hour or so then moved to another new location for me, Gürtnellen. This was a bit of a risk as I was unsure what time the sun bacame right, nor for how long, at this spot. I got there about 2pm and the light was only just becoming correct, by 4pm when I had to catch the bus in order to get back to Basel for my flight, the shadows were already becoming a problem. I understand that in summer this location is best from about 3pm onwards until early evening. To reach here you need to alight the bus at Gürtnellen Wiler/Gotthardstrasse. There is just the one road opposite down into the village, cross the river and turn immediately left. Follow this lane until it passes under the railway. Now a track it climbs uphill away from the railway but after about 100m there is a signed footpath back down towards the line through a gate. I ended up with just under two hours at this beautiful spot and it was strange to think that despite having a full day on the Gotthard (I could only have had another 30 or 40 minutes worth of sunlight here), I still got back home to Preston later that day, well in the early hours of Saturday. 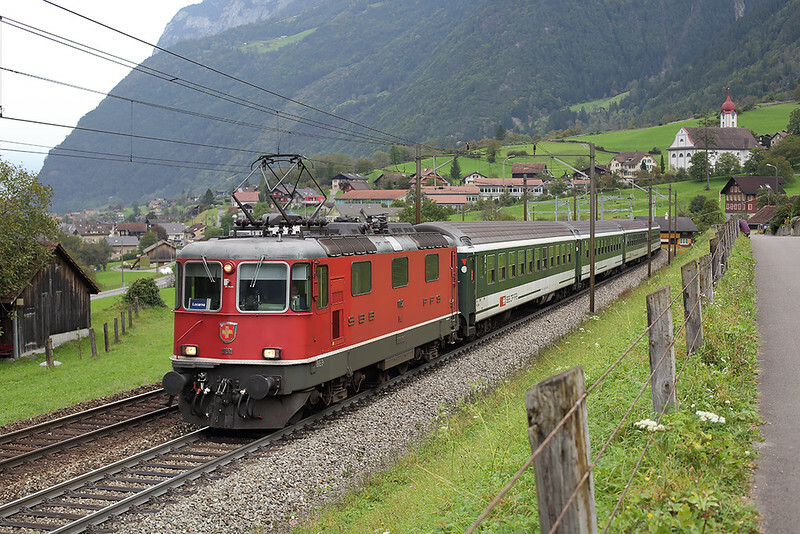 My final shot from Switzerland, very nicely, was of a classic pair of SBB Re 4/4s on a freight. 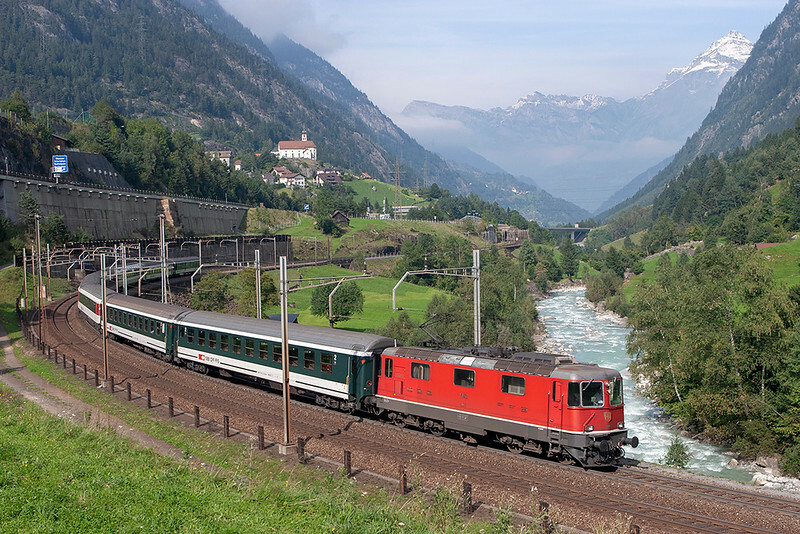 I hope this selection of pictures will be of interest to anyone who might be considering visiting the Gotthard route in 2015 before most trains get diverted away from it through the Base Tunnel, and the directions to the main locations will be of use. All the pictures I took can for about a month be found in my New Additions section, after which they will be moved to the 2014 Trips bit. I've no plans as yet for any more trips, with the clocks due to go back soon light will become even more at a premium in an afternoon so days out will have to involve longer visits to the pub than hitherto. I might make an effort this year to photograph some of the seasons Rail Head Treatment Train workings, I've got a week to research where these are running before my next days off. Thanks as always for taking the time to read my blog, please watch out for future editions or check the Railwaymedia website for new additions. Bye for now. A warm welcome as always to another edition of the Railwaymedia blog, I thought I'd try to squeeze a quick edition in before the end of August whilst the family are out and I've got a little bit of time to sit down undisturbed. School holidays have determined where I have been this month, rather than having a couple of days out around Britain myself I've been on a couple of longer family trips, although of course I managed to still get a few bus and train pictures along the way. The final trip of July was on the last day of the month and was a trip to Kent. 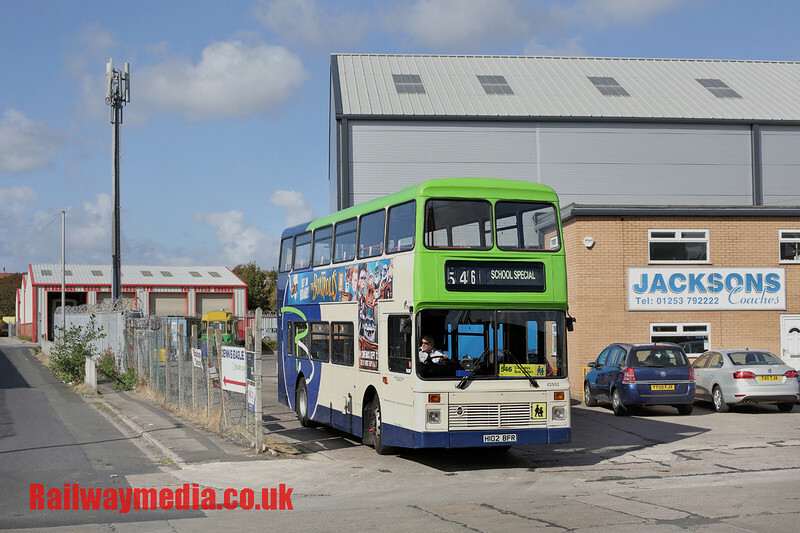 This area is one of the few strongholds for older Stagecoach buses with a good fleet of Volvo Olympians spread around the depots and a few B10M single decks at each one too. Readers of previous blogs will have noticed my trip to the Isle of Arran to photograph their fleet of these buses. All single deck buses have to meet the 2000 Accessibility Regulations from January 2016 with double decks the year after, so time is running out for these type of buses, generally those with registrations plates of 'S' or earlier. 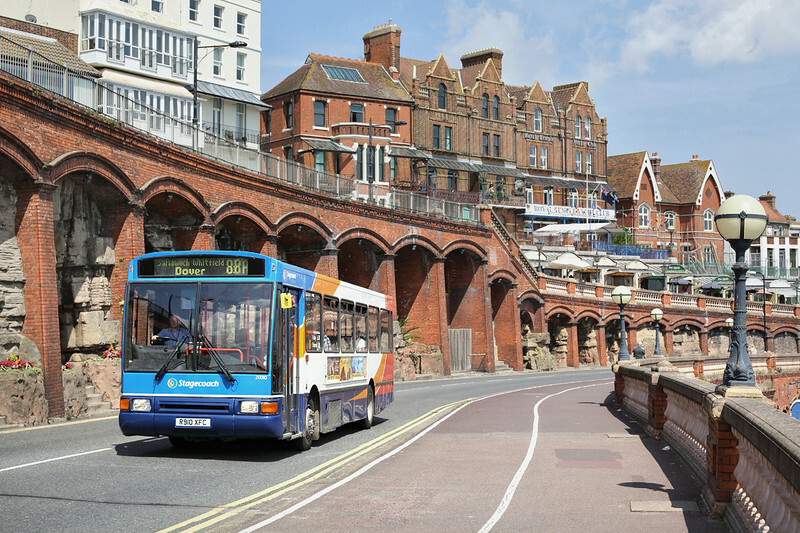 I still need a couple more trips to the area to get some more shots of these buses, Hastings still has a few plus I have been intending to visit the Romney, Hythe and Dymchurch Railway for some time so hopefully I will try to fit at least one of those in during September. Continuing with buses, a few days after that I had a trip to Liverpool, an area I spent a lot of my childhood in but haven't taken many bus photographs there since the mid-1990s. I had no firm plans on where I was going to go but started off with breakfast in Bootle where the weather was perfect for a few pictures on Stanley Road near the Strand shopping centre. 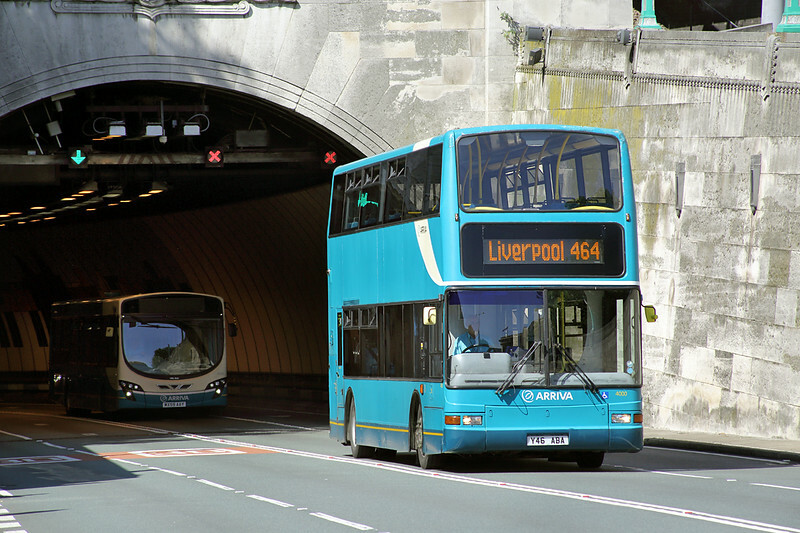 I then moved on into Liverpool before heading under the Birkenhead Tunnel (pictured below) to the Wirral. Heswall was a place I wanted to go, my first visit there in the 1980s had been suprising as this small town had a massive Crosville bus depot behind the bus station. A pub has replaced that now unfortunately though a small bus station remains. By this point I was getting more interested in having a few beers than taking pictures anyway. I stopped off in Irby on the way back to liverpool for a picture (and a pint) and ended up having some food in the Shippons pub in the village which do the strange offer of giving you a free main course if you buy a starter. You wouldn't really pay £5.50 for the starter itself of course but for two courses, good quality too, I couldn't complain. I only managed one train picture on the Merseyside trip but managed a few more on the follwoing weeks family trip to Windsor. The kids had been wanting to go to Legoloand for a long time (unlike me) so with a fairly reasonable price for the Travelodge in Windsor for two nights it made for a good mini-break. I've passed through Windsor a few times but never stayed, it is of course a nice town, but avoid the daytime between about 9am and 6pm when the tourists coach loads descend! Totally by coincidence (really) the day that was planned for the Legoland visit was the same day that I would normally have gone to the excellent Egham Beer Festival which is only about 10 miles from Windsor so, managing to get out of Theme Park Duty I had a pleasant day there instead, managing a few pictures both there and in nearby Staines, including my first sight of one of the former Gatwick Express class 460s Juniper units that have now been converted into class 458/5s. 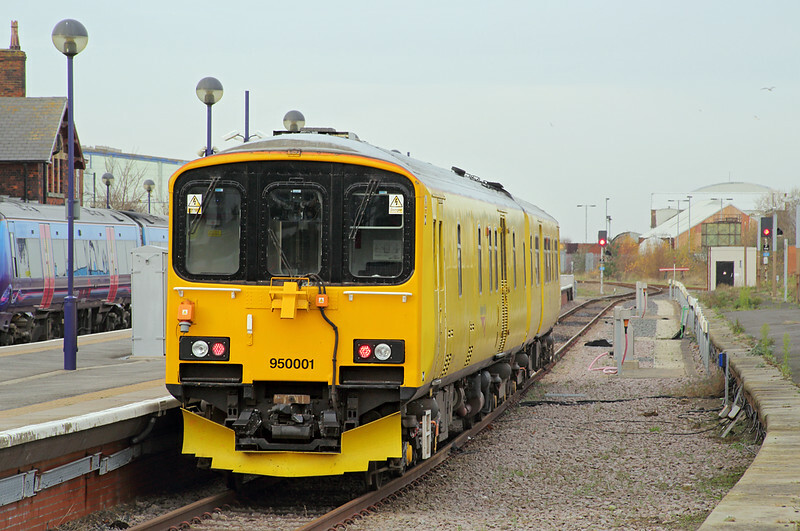 The original 458s were very similar to the 460s except for the front nose-cone and the luggage areas fitted to the Gatwick trains; the project underway involves converting the 8x8-car 460 units and 30x5-car 458 units into a homogenous fleet of 36x5-car units. 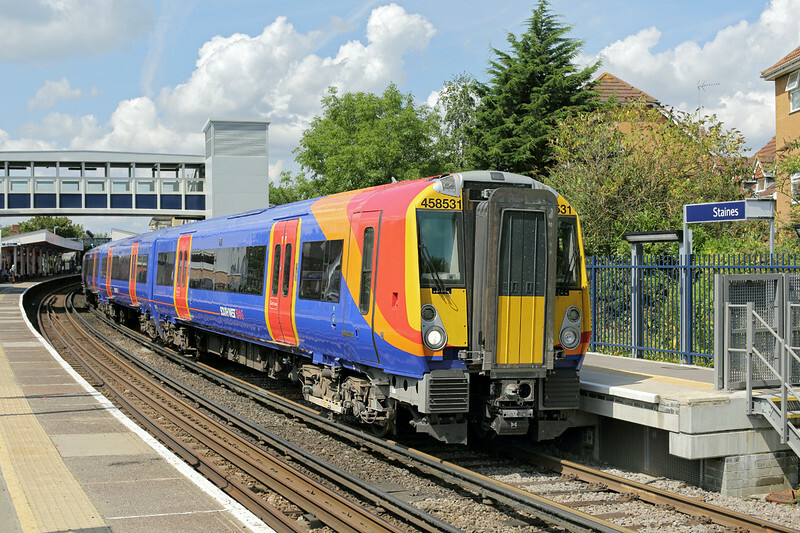 The biggest thing to note is the new front which has been made to look similar to South West Trains fleet of Desiros. 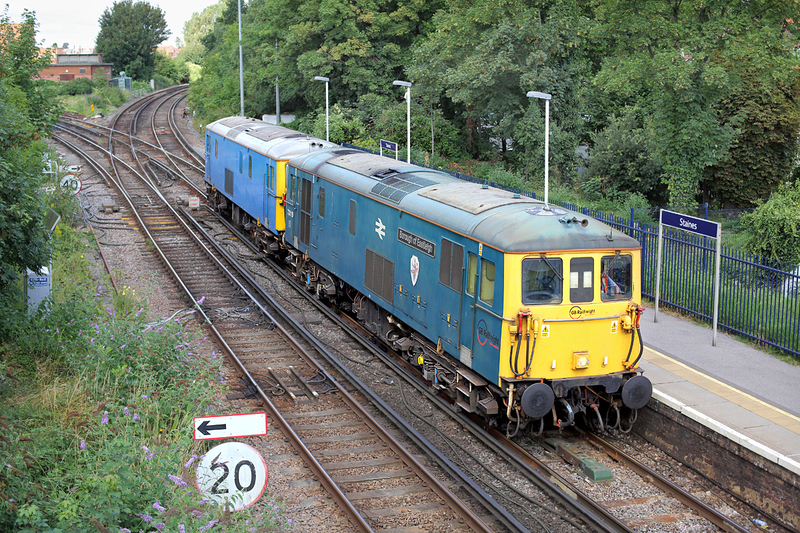 Highlight of the day for me was a pair of Class 73s running light engine through Staines, a class that I don't get to see too often; the beer festival is only a five minute walk from a footbridge over the railway which is the main freight route from London towards Eastleigh, so I was also able to nip out a couple of times when Real Time Trains informed me something interesting was coming. The following week was the second family mini-break, this time a slightly longer one to Germany. We travelled by Eurostar and Deutsche Bahn's ICE to Cologne then local train onto Koblenz where we stayed 3 nights in the Hotel Continental next to the Hauptbahnhof. It was a typical European City hotel, fairly old and basic but very convenient for the station and only about a 10 minute walk to the Old Town. Situated at the confluence of the Rheine and Mosel rivers Koblenz is a popular stopping off point for the many Rheine cruise boats that ply the river; the river valley south from Koblenz is an UNESCO heritage site and is well worth a visit for both scenery and railways. I had a massive stroke of luck when we arrived in Koblenz as three minutes later one of DBs heritage BR103 electric locos arrived on the Salzburg to Münster inter-city service. Brought in a few years ago to solve a minor engine shortage there is still a regular diagram a few days a week for these 1970s locos which were once the flagship of the German fleet. A local photographer told me the time that it was due back in the morning so I was able to get a second shot of it returning before our planned visit for the day to friends staying on a campsite nearby across the river. 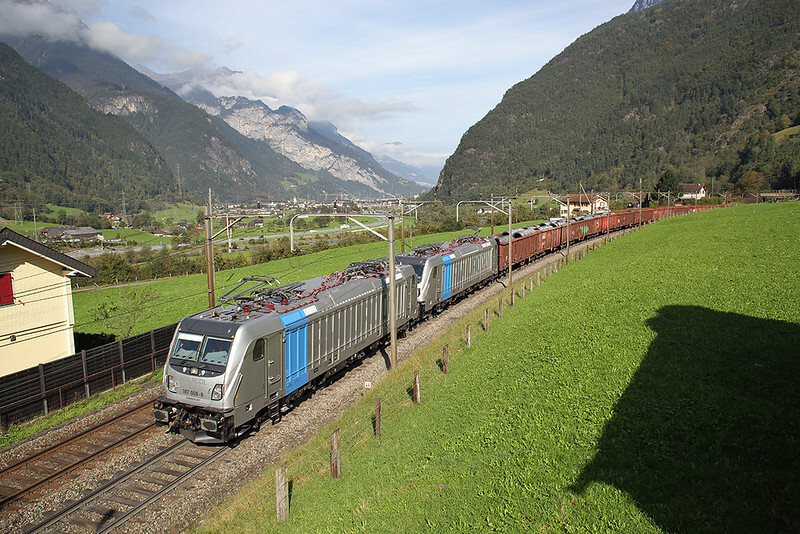 Currently these locos are working the 0700 Salzburg to Münster on Fridays, Saturdays, Sundays and Mondays and return the following day on the 0727 Münster to Innsbruck. Our friends were staying about 5 miles from Koblenz in Oberlahnstein at the campsite Burg Lahnek. I'm not into caravaning but if I were I would definitely stay at this place, high above the Rhine Valley and with an excellent adjoining bar/restaurant and outdoor swimming pool; sat drinking beer by their caravan I was able to see and hear the trains on both sides of the river. 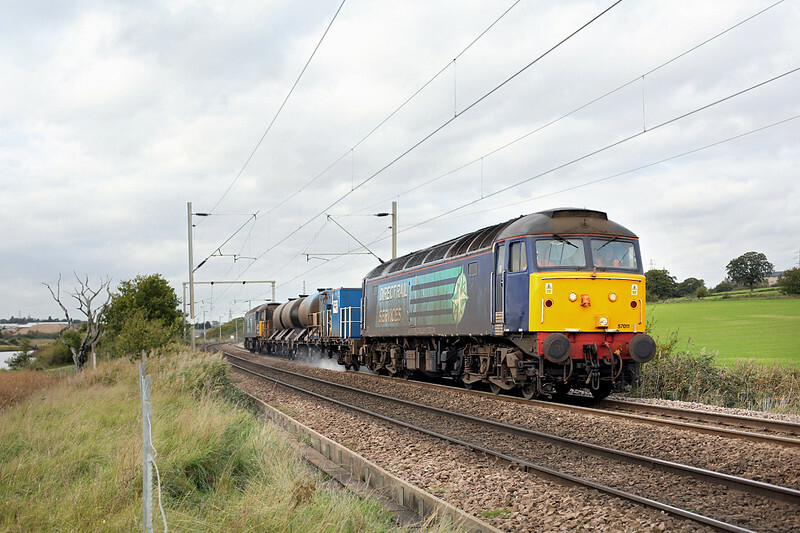 Generally from observation most freight trains run on the east bank of the river, which has in addition just an hourly passenger service operated by units. 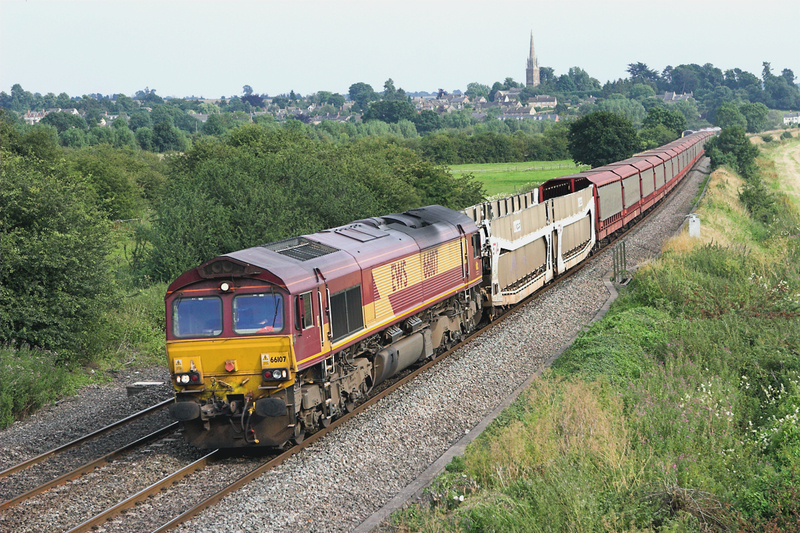 The west bank has some freight but is much more busy with passenger trains with an hourly local service, at least hourly Inter City trains, and a roughly two-hourly Regional Express working that is currently operated by top and tailed BR143 locos. After a lovely sunny day at the campsite the following day started much more dull and by dinner time had descended into heavy rain. I had two hours photographing in the morning at a random station on the west bank then later we went for dinner at the first major town south of Koblenz, Boppard. There used to be a branch line service operated by BR218 'Rabbit' diesel engines but this is now worked by a single car DMU. The town itself is attractive, we ate at a restaurant on the bank of the Rhine watching (to a bit of frustration from me) a procession of freight trains trundling along the opposite side. There is a small ferry across the river at this point but I wasn't allowed away! We headed back home via the same route we had come, namely via Cologne, Aachen, Brussels and Eurostar, though this time we took the slower trains back to Brussels including the trip across the border from Aachen to Welkenraedt on one of SNCBs elderly units that are still operating despite a big influx of new Desiros that have now taken root in the Brussels area itself. That has been it this month for trips, I suppose really I've not done too bad as most were made with the family; schools go back next week so I'm already thinking about where I can head on my next days off, Kent as mentioned for one. 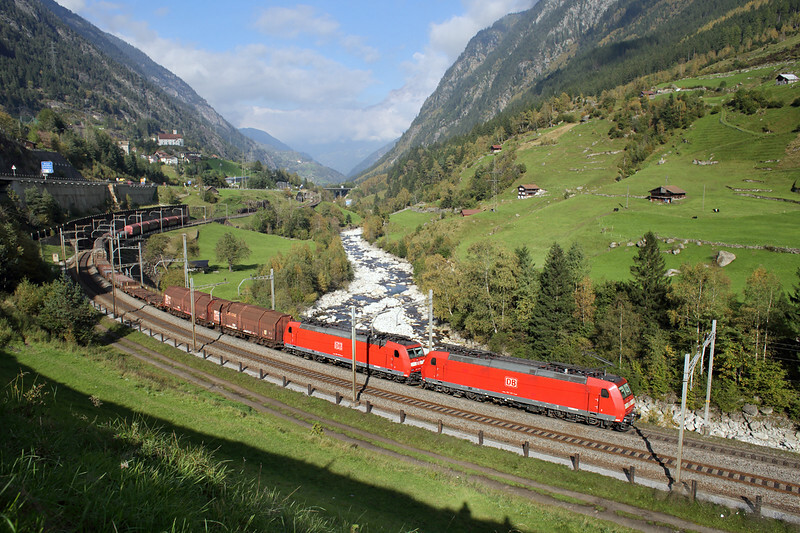 The end of next month a trip to Switzerland has been booked in order to get some last shots on the Gotthard route through the Alps before the Base Tunnel opens in 2016, cutting journey times but also removing most of the freight trains from this busy scenic section of line. 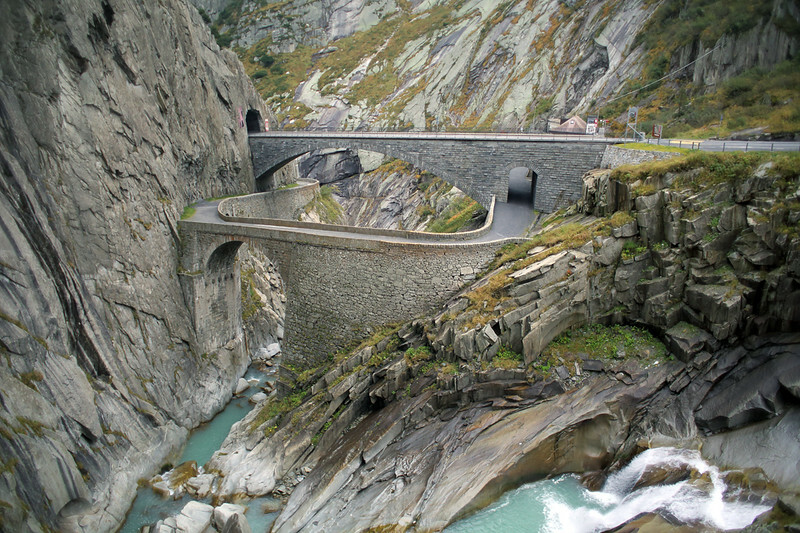 I visited here back in 2008, the shots from the Gotthard can be found HERE. For the next week or so I will be continuing the long process of working my way through my scanned pictures Thanks for reading this latest waffle, I shall try to get time to write another before I head to Switzerland, for now I'll leave you with one of my more interesting bus scans from 1991. Hartlepool Transport at the time had a large fleet of rare double-doored Bristol REs that at the time of this picture were over 20 years old and lasted another 3 until Stagecoach took over.